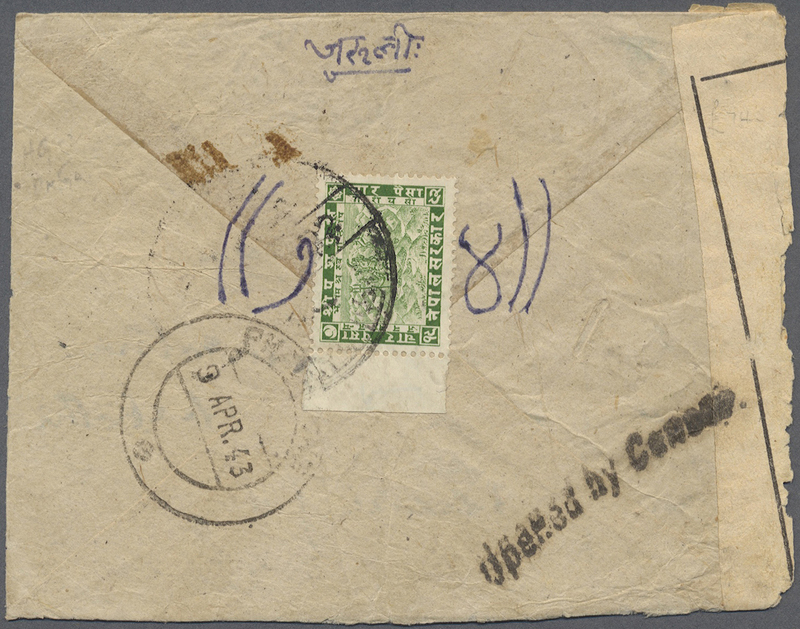 9372 Brief (cover) 1941, incoming mail, India: reg. 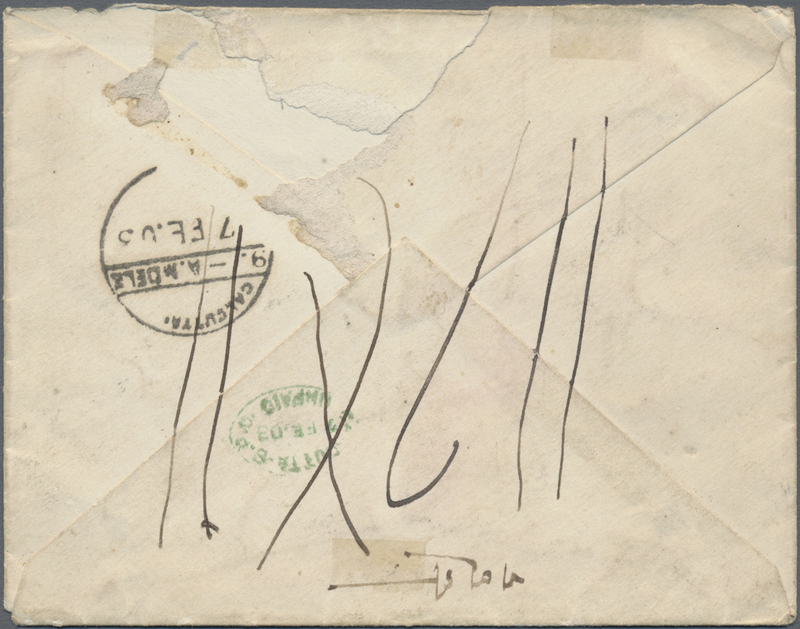 cover w. franking on reverse tied "VERAVAL 1 FEB 41" to Harbin w. "Harbin Taowei 8.3.15" (March 15, 1941) arrival, Indian censortape and tie-marks. 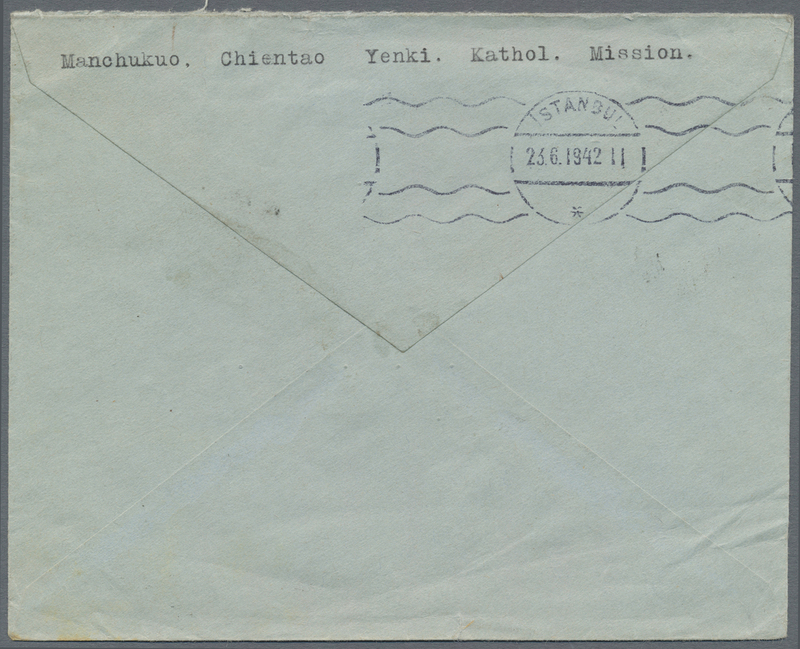 9373 Brief (cover) 136 1942, 10th anniversary 20 F. tied "HSINKING 13.5.42" to cover to Switzerland, endorsed "Swiss via Sibiria-Tiflis-Erzerum-Istambul-Sofia-Wien-Basel", on reverse "ISTANBUL 23.6.1942" transit. 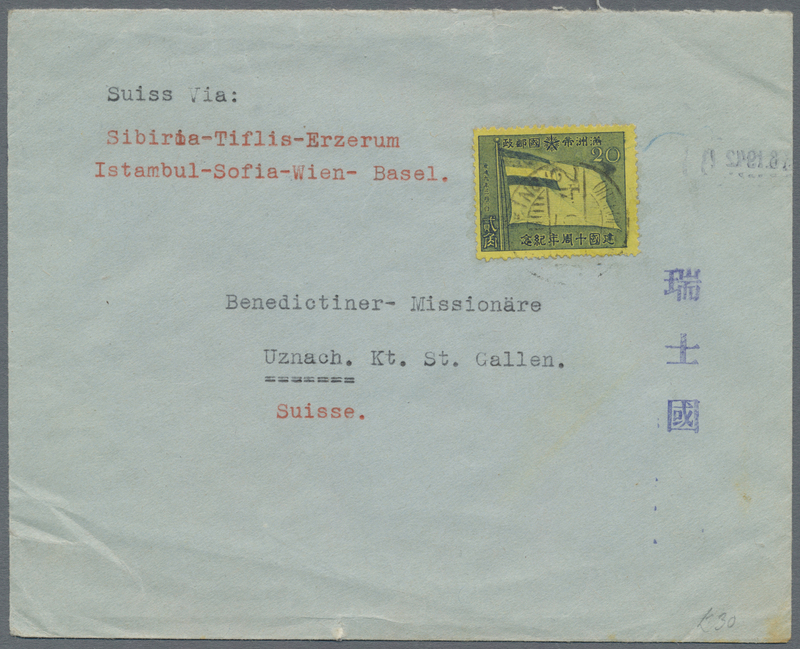 Commercial usage from Yenki Catholic Mission to brothers in Switzerland. 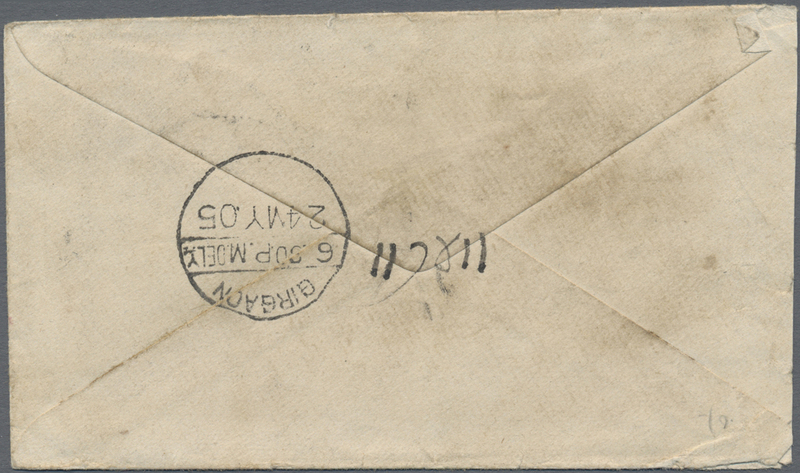 9375 Brief (cover) Russian Offices in, Urga, 1897, 7 K. tied "URGA 18 2 97" to reverse of redband cover to Kalgan, stamp corner torn, cover 12 mm tear. 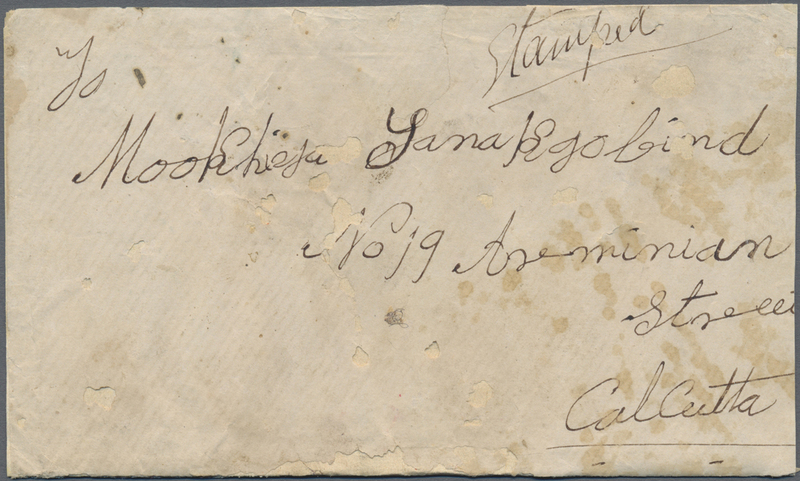 9376 Brief (cover) 1904, Russia 1 K., 2 K.(strip-3) tied violet "URGA 3.VIII.04" to reverse of redband cover to Peking-Waegwan w. arrival russian p. o. 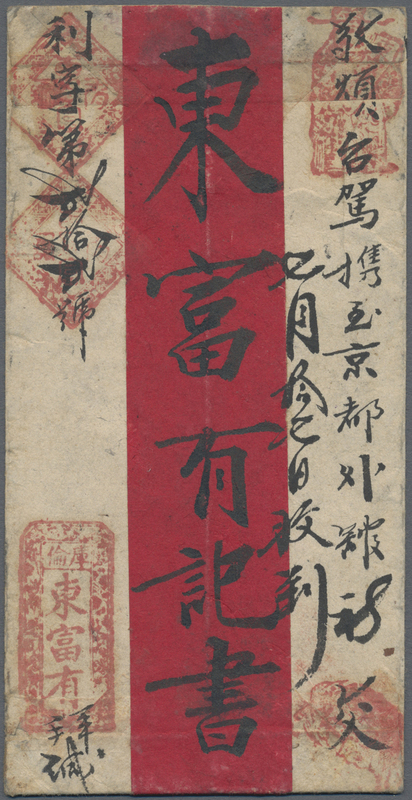 "PEKIN 13 ... .04", violet colour of Urga date is rare. 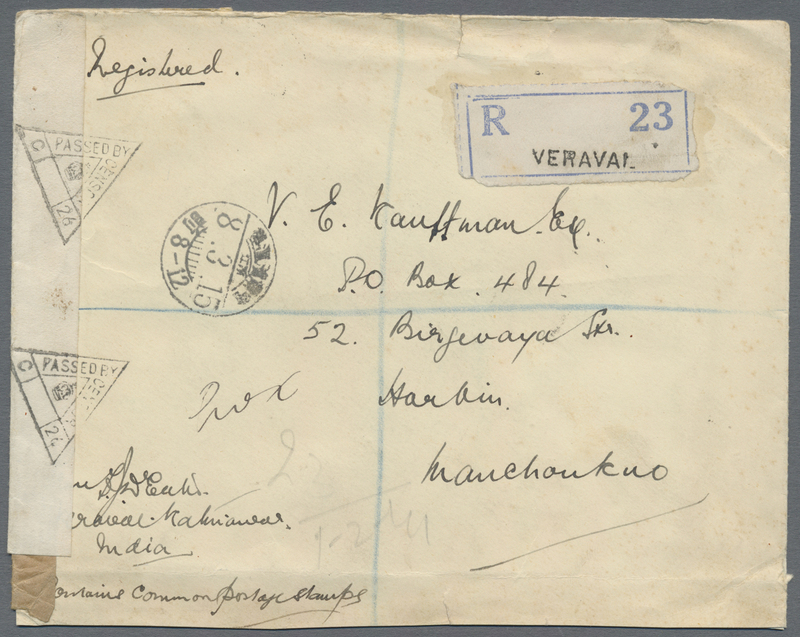 9377 Spostfrisch (never hinged) **ErsttagsblätterAnsichtskarte (Picture postcard) 2C (27) Spec 1924 First issue 2c. 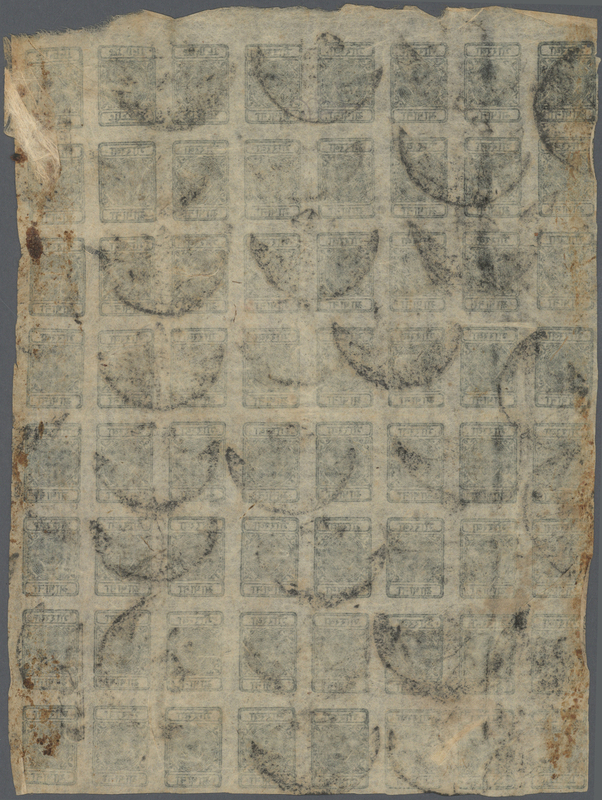 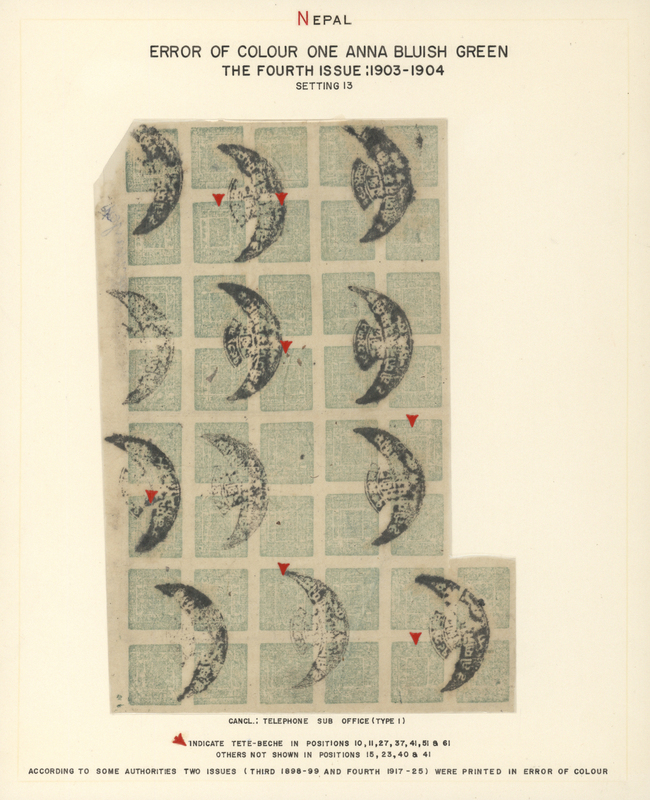 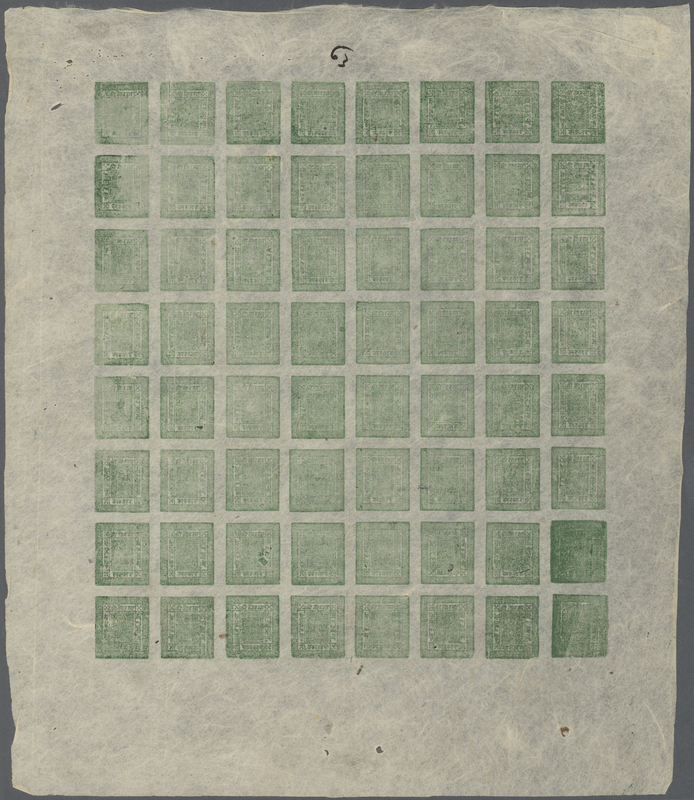 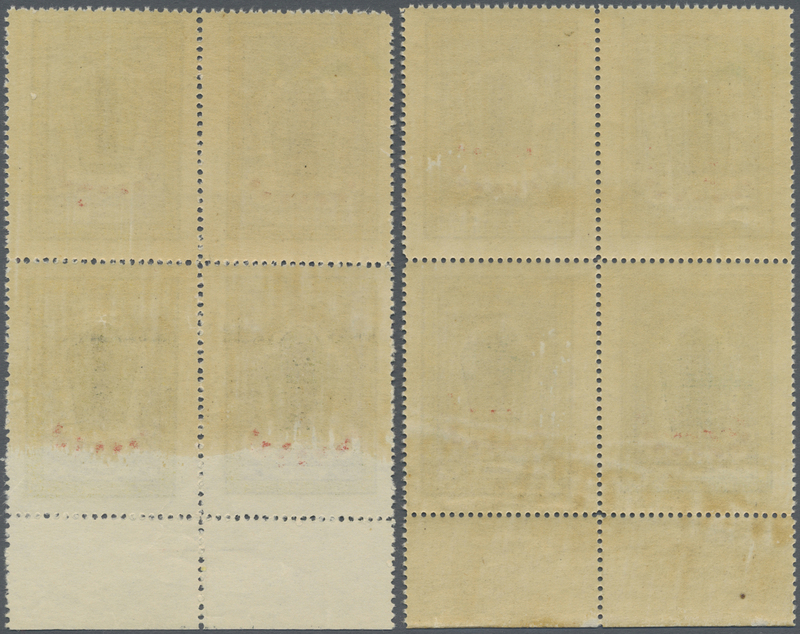 left hand marginal block of 27, Perf 10, additionally perforated "???????" 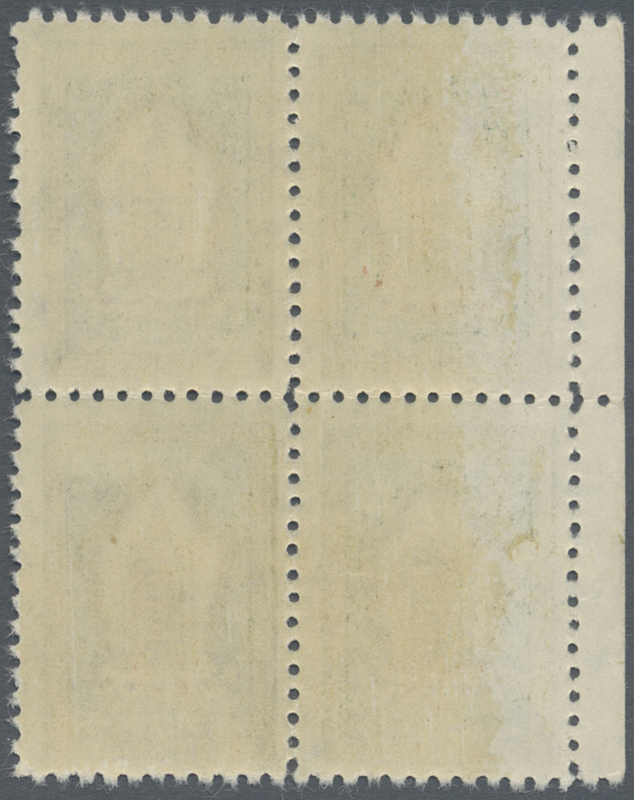 (SPECIMEN) and with horizontal perforation 13½ through stamps, mint never hinged with lightly toned gum as usual, very fine. 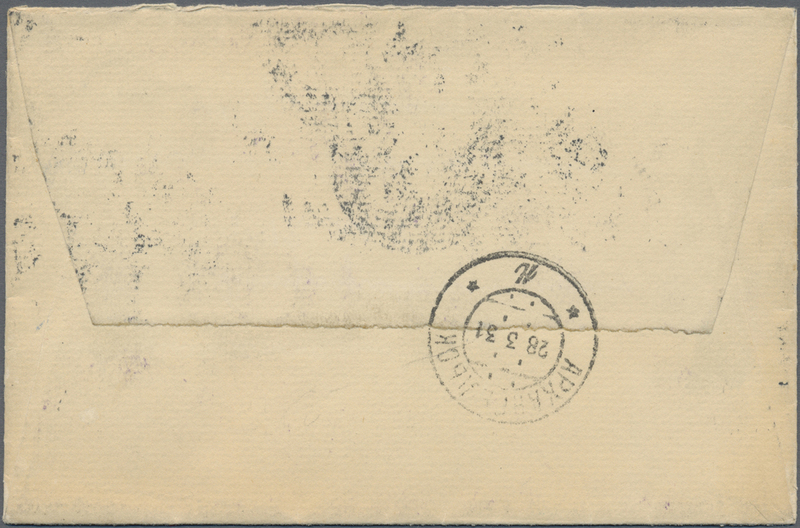 9378 Spostfrisch (never hinged) **ErsttagsblätterAnsichtskarte (Picture postcard) 4A (14) Spec 1924 First issue 10c. 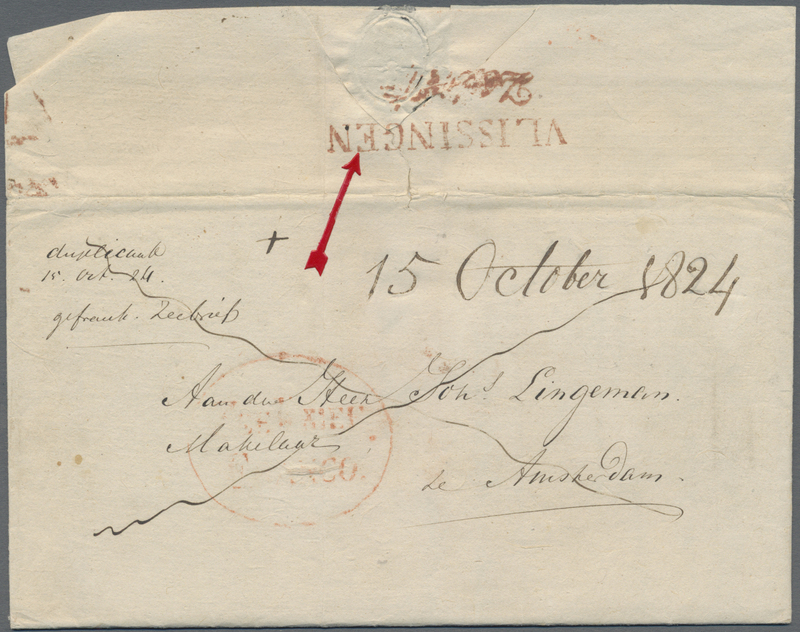 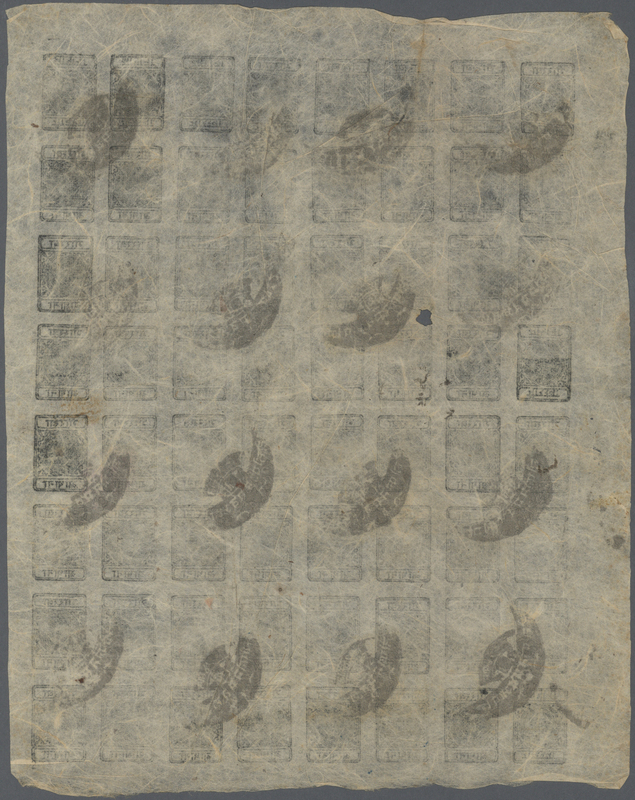 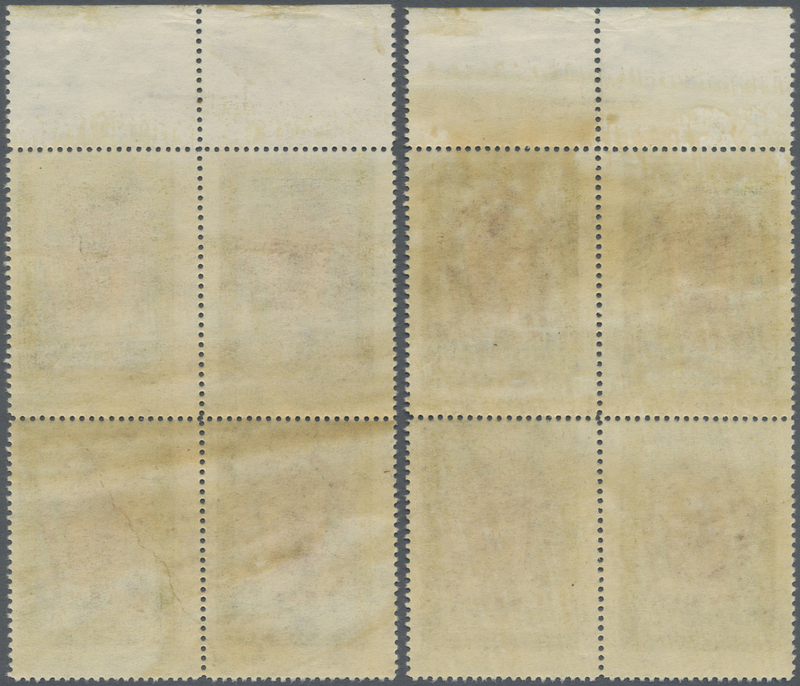 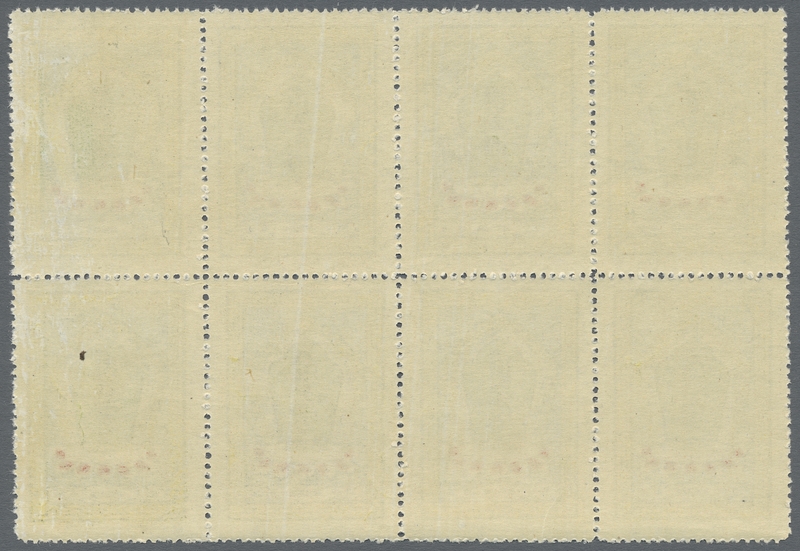 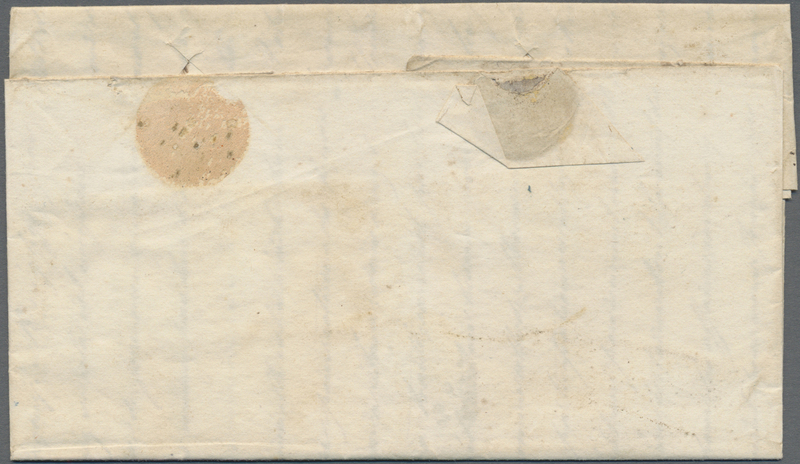 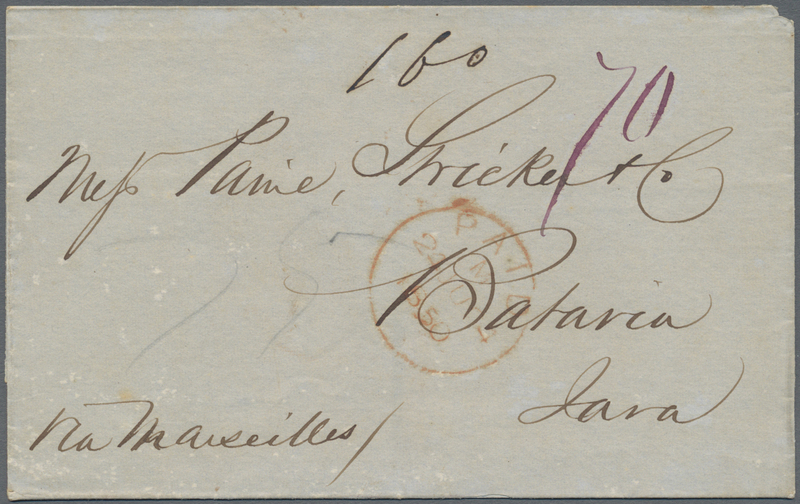 left hand marginal block of 14 (2x7), Perf 13½, additionally perforated "???????" 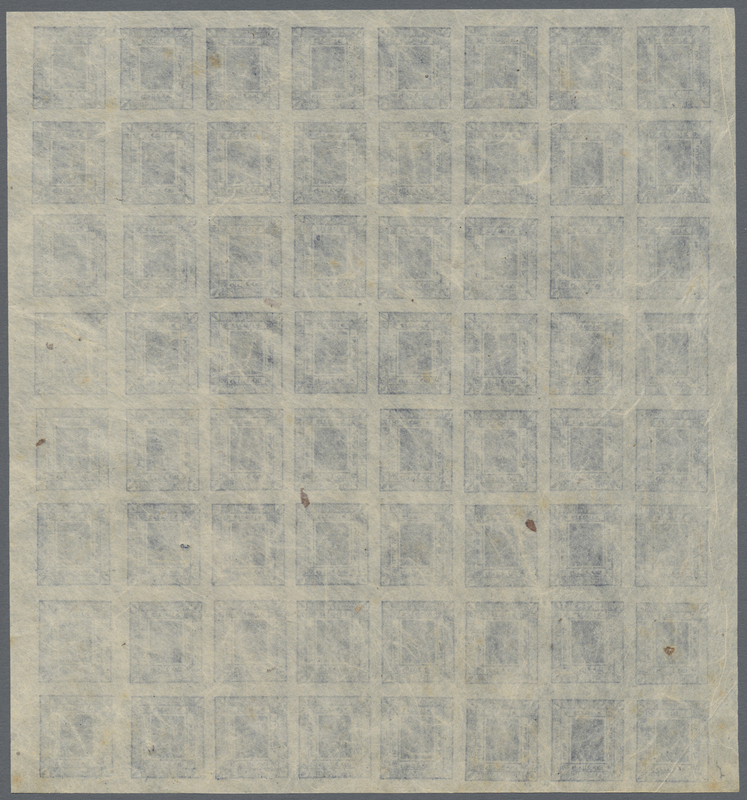 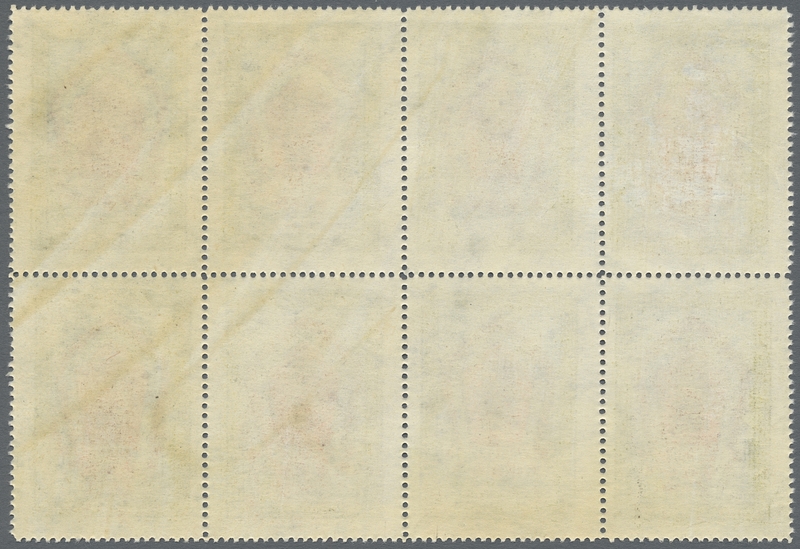 (SPECIMEN) inverted, and with horizontal perforation 13½ through stamps, mint never hinged with lightly toned gum as usual, very fine. 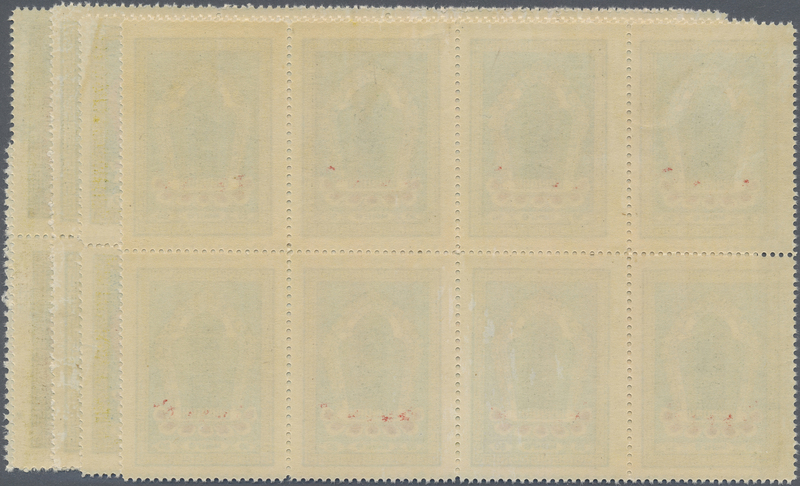 9379 postfrisch (never hinged) ** (4) Proofs 1924 First issue 10c. 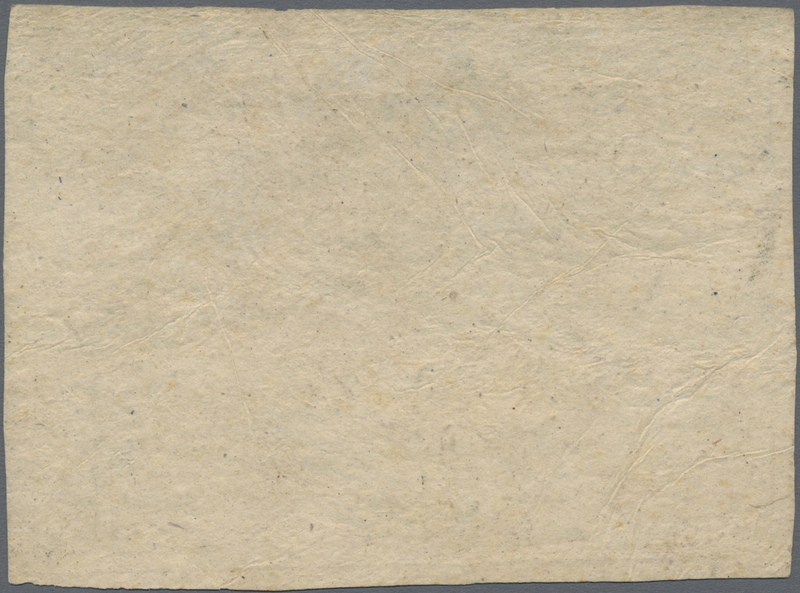 IMPERFORATED PROOF, right hand marginal strip of 5, variety "SHIFTED COLORS", with horizontal perforation 13½ through stamps, mint never hinged with lightly toned gum as usual, very fine. 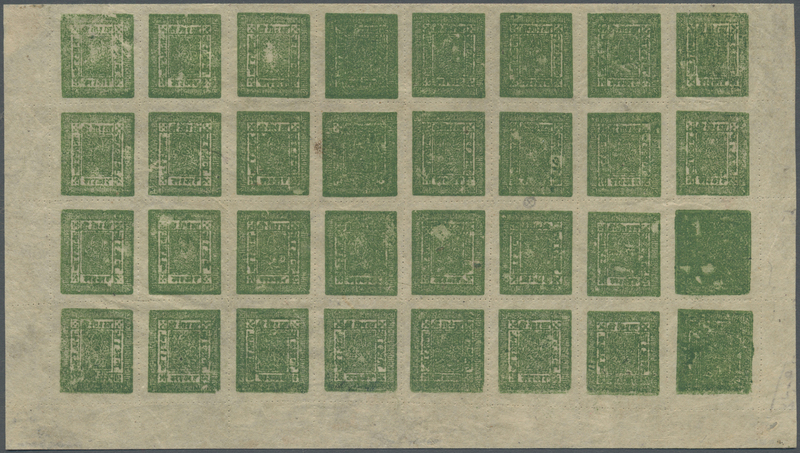 9380 postfrisch (never hinged) ** (4) Proofs 1924 First issue 10c. 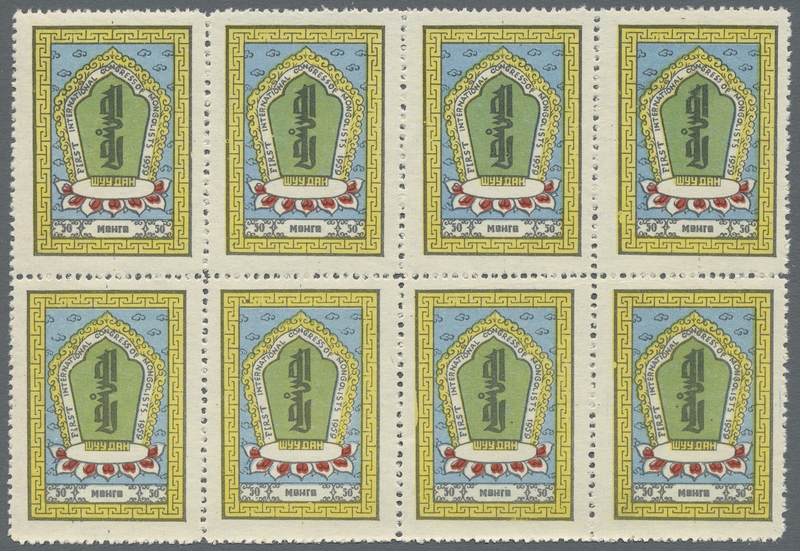 IMPERFORATED PROOF, bottom right corner strip of 6, variety "SHIFTED COLORS", with horizontal perforation 13½ through stamps, mint never hinged with lightly toned gum as usual, vert. 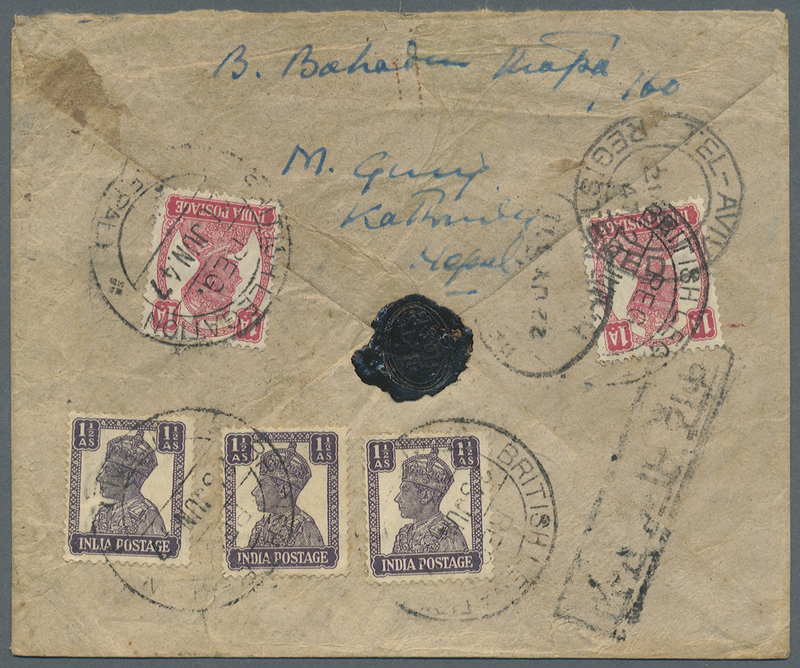 paper fold through 3rd stamp from left, partially separated and few 'open' perf holes at left, still fine, attractive and scarce. 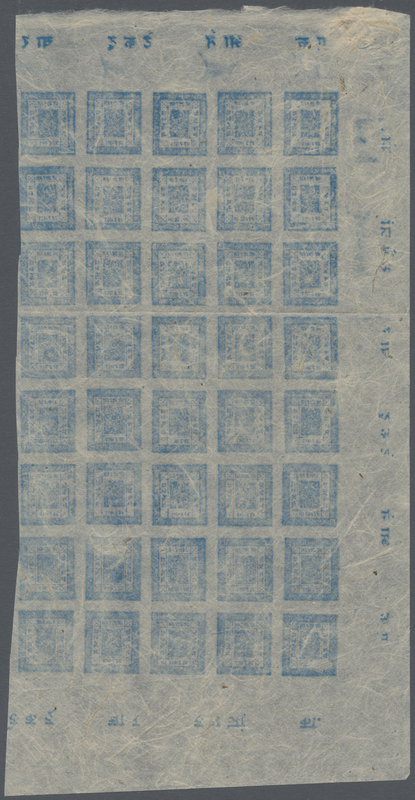 9381 Brief (cover) 10, 12, 13 + China D 1926 Provisionals 50c. 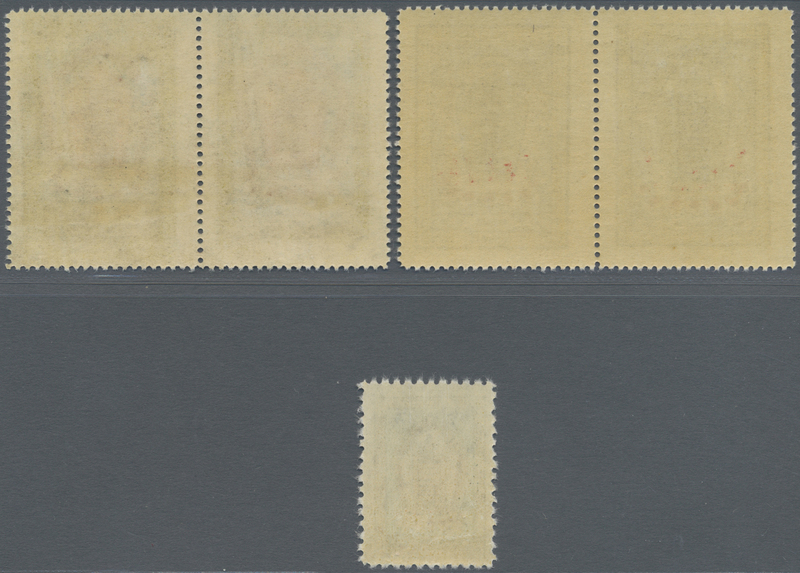 red-brown on yellow, 20c. 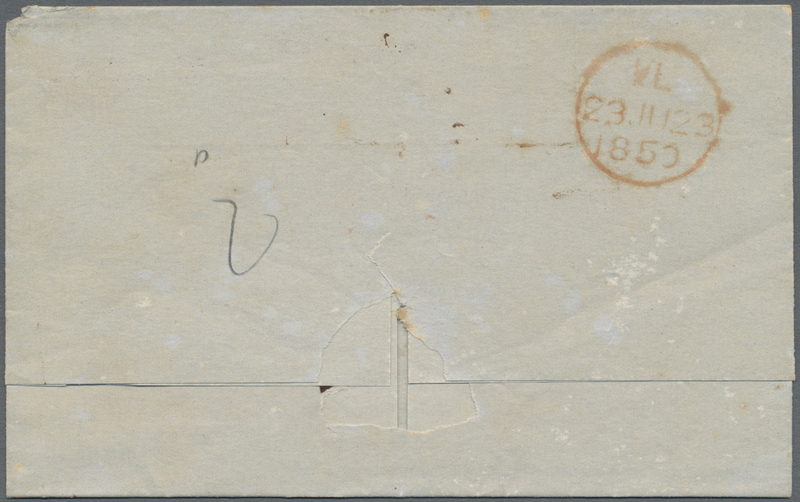 brown and 5c. 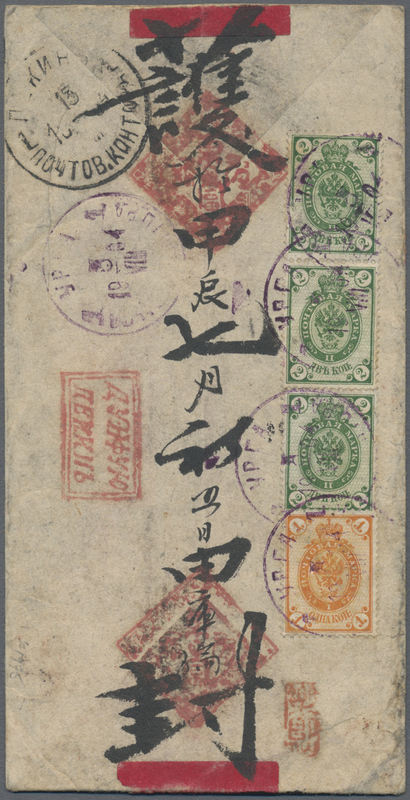 purple, all with ORIGINAL bilingual framed "POSTAGE" overprint in violet, used on registered cover 1926 from Ulan Bator to Tientsin, China, all tied by "ULANBATOR MONGOLIA/30 VI 26" double-ring datestamp in black, with Ulanbator Reg. 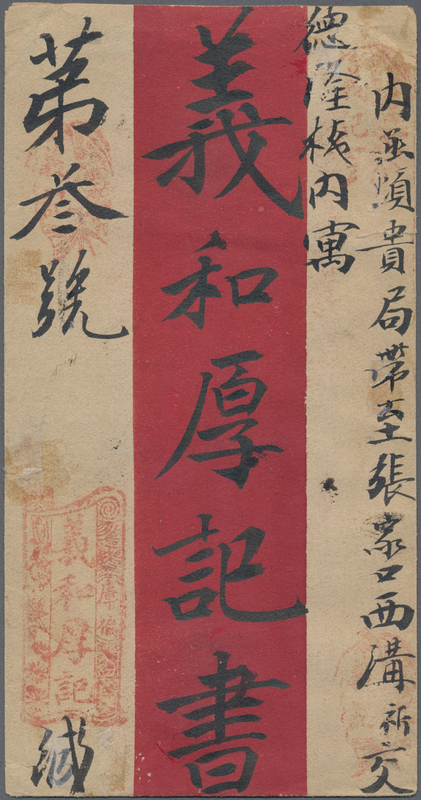 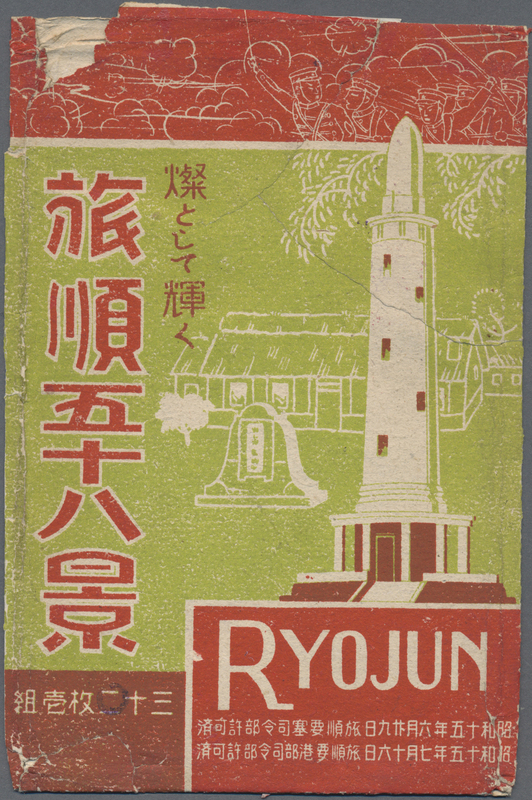 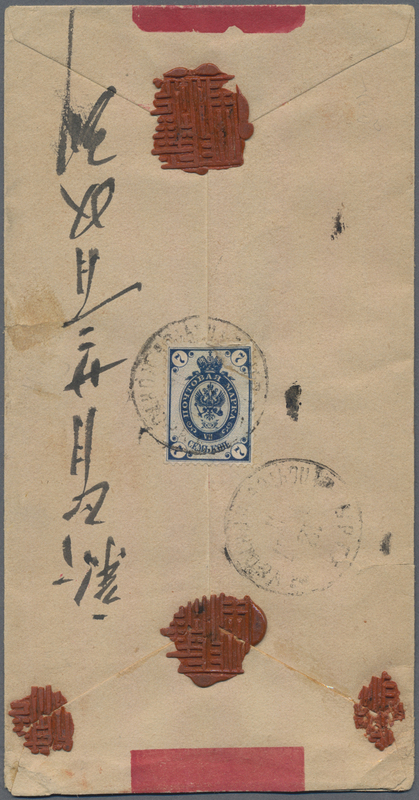 handstamp on front, and with necessary Chinese postage due stamps 4c. 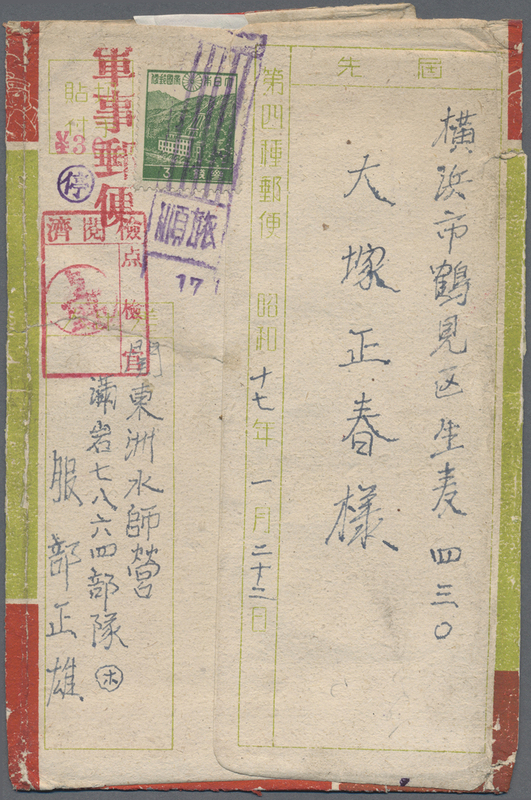 blue pair plus others which were lost, tied by bilingual "TIENTSIN/15.7.26" cds. 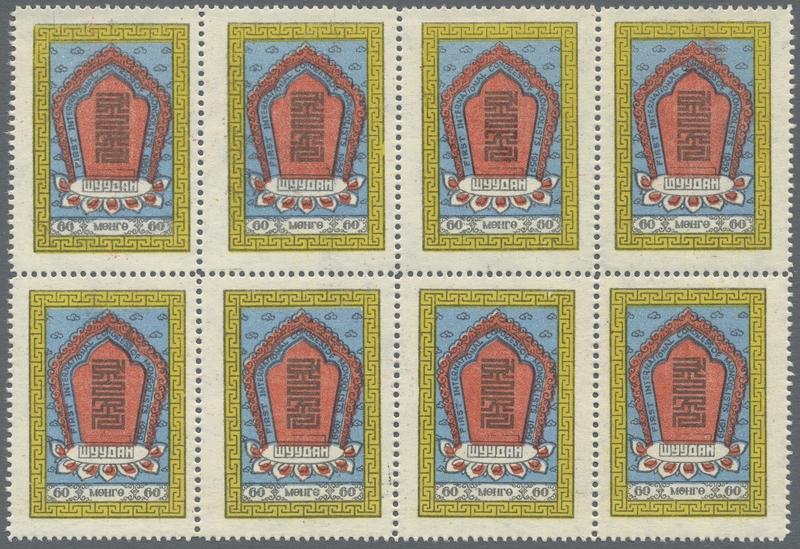 Although two or three Chinese stamps are missing, it is AN ATTRACTIVE COVER WITH A RARE FRANKING OF THE 50c. 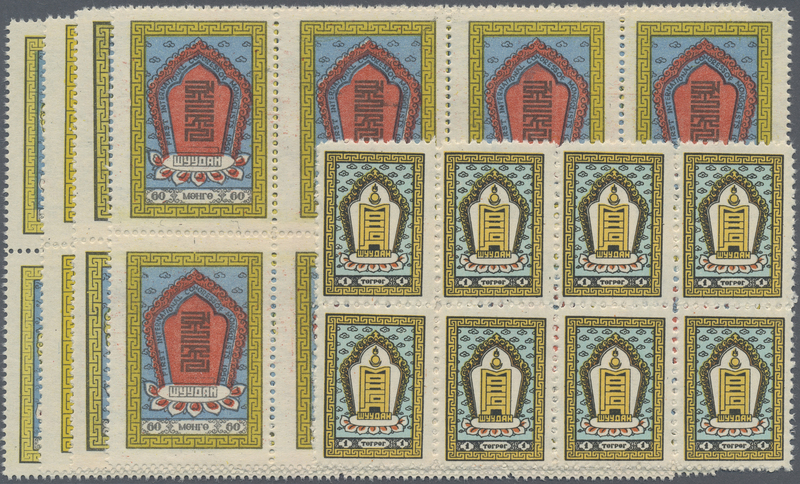 (plus others) BEARING THE ORIGINAL POSTAL OVERPRINT. 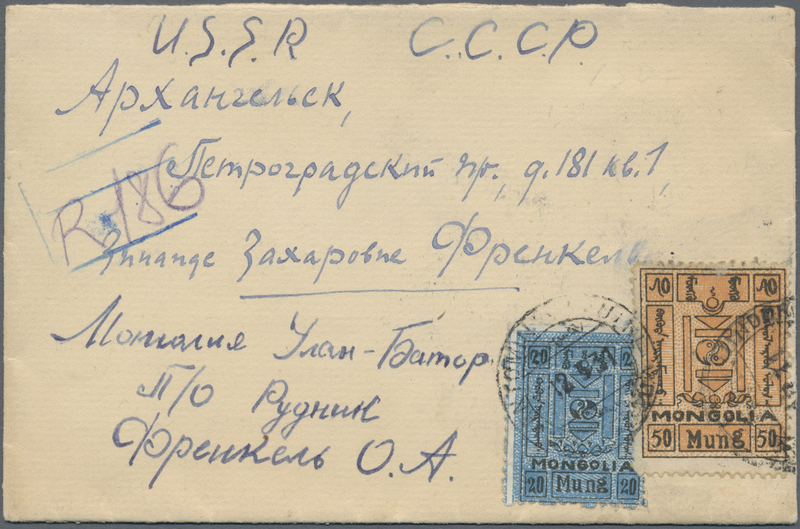 9382 Brief (cover) 24, 30 1926/29, 20 Mung and 50 Mung tied "ULANTOMIN... 12 3 31" to registered cover to USSR with "ARCHANGELSK 28 3 31" backstamp. 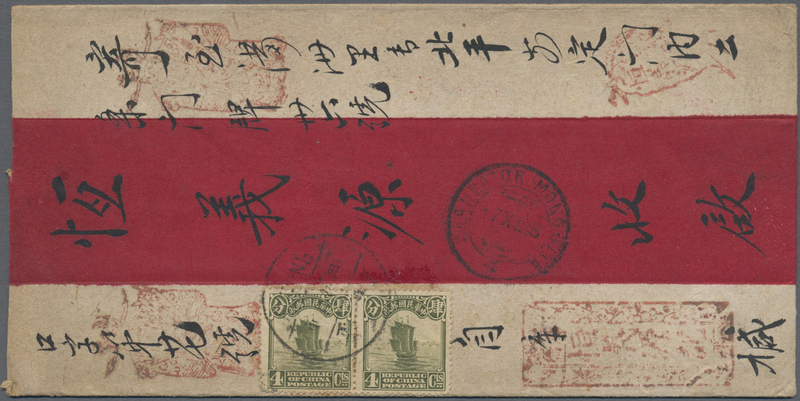 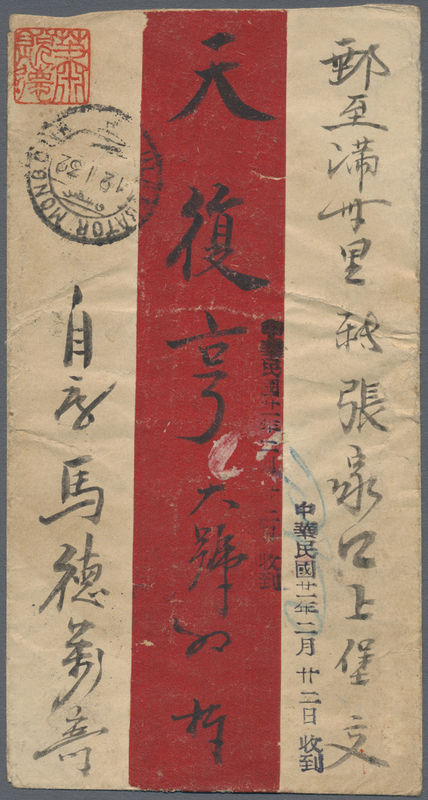 9384 Brief (cover) 17, 20 + China 193(2 1928 Red-band cover from Ulan Bator to PEKING franked by 1926 20m. 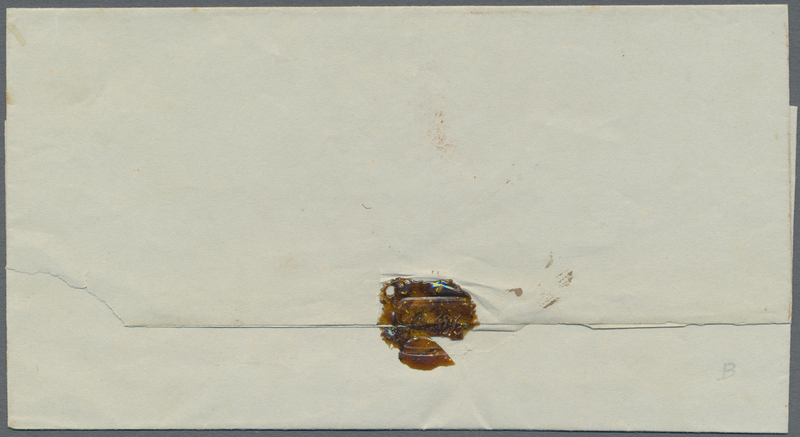 blue & black and 5c. 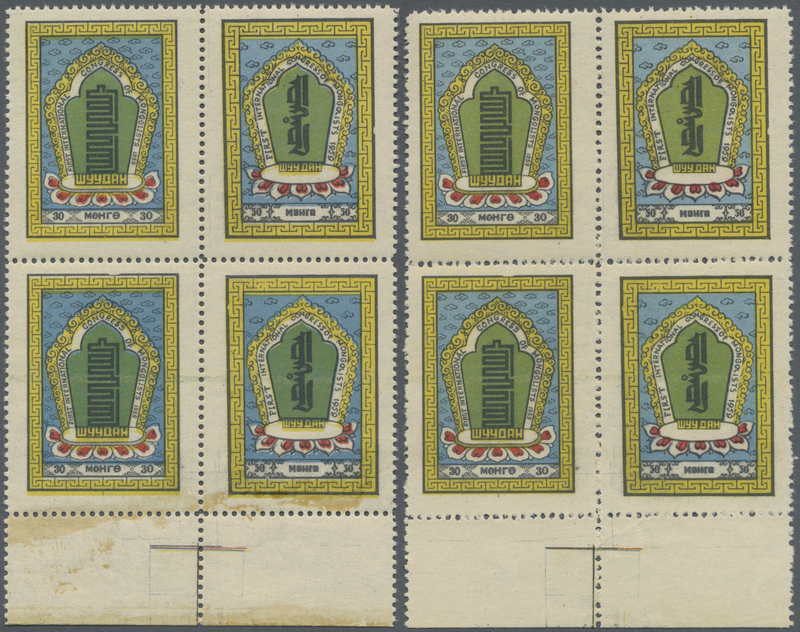 grey-lilac & black for Mongolia 25m. 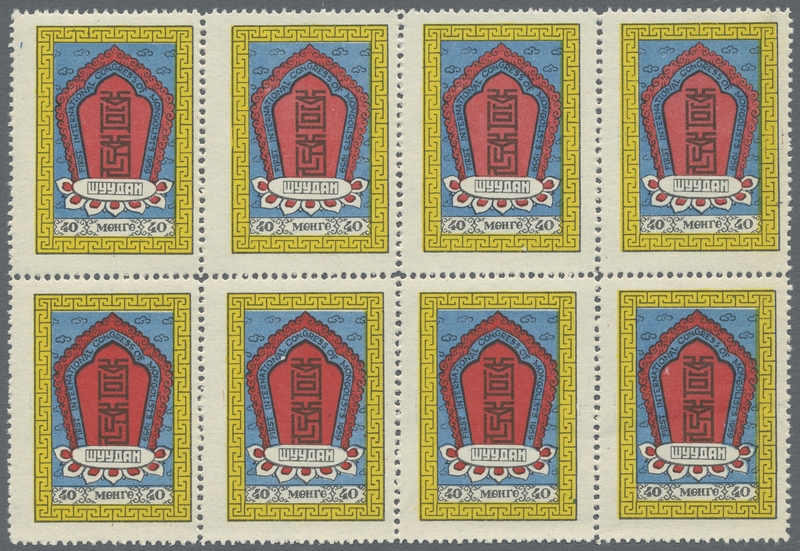 inland rate, both tied by "ULANBATOR MONGOLIA/17 X 28" cds, and Chinese 1926 4c. 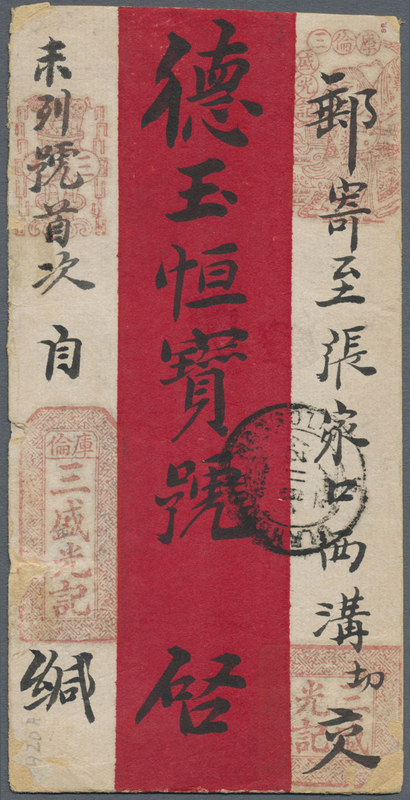 olive pair (for Chinese rate) tied by bilingual "PEKING/30.XI.28" cds, fine. 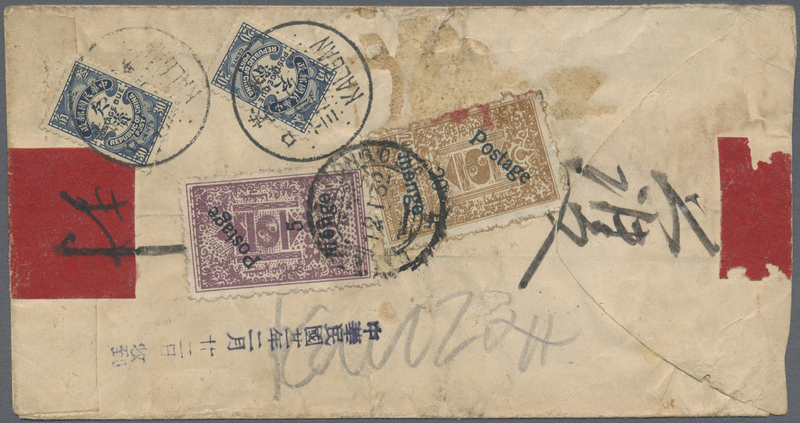 9385 Brief (cover) 43, 45 + China Dues 1932 'Menge' Provisionals 20m. 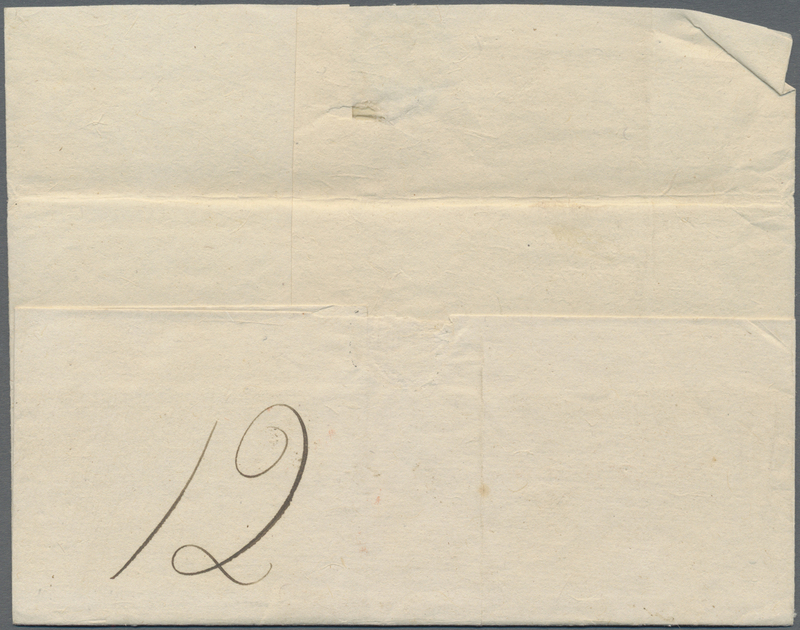 on 20c. 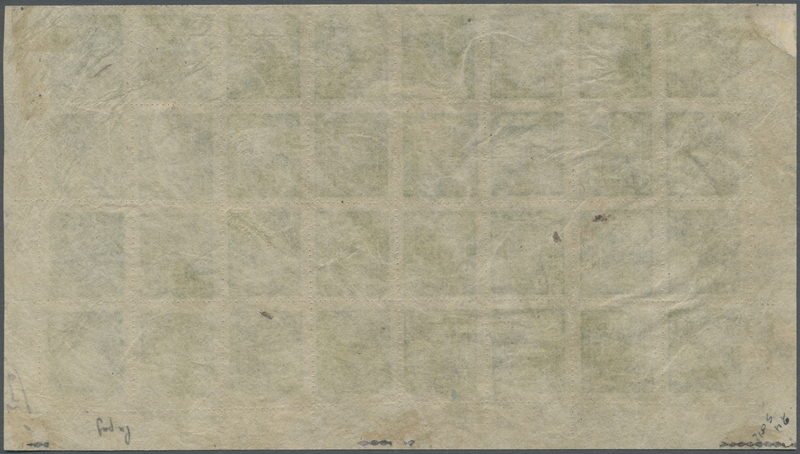 brown and 5m. 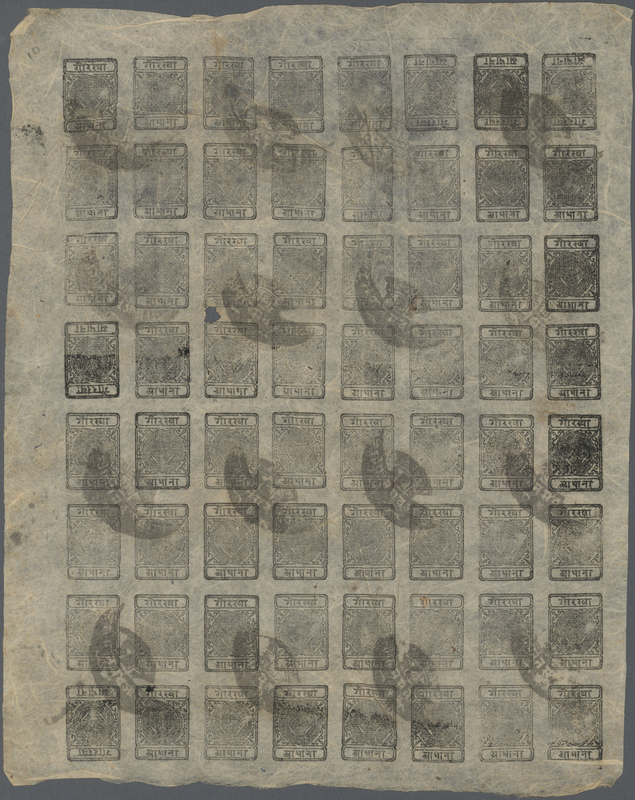 on 5c. 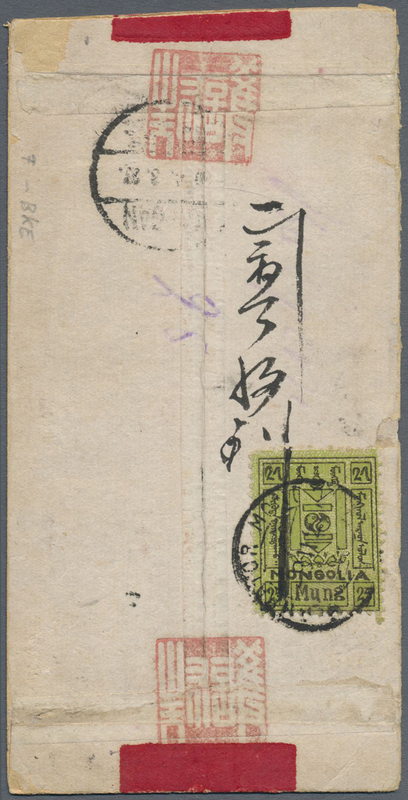 purple, both with interrupted perforation, used on red-band cover from Ulan Bator to Kalgan, China probably via the northern Baikal route via the border city of Kjachta (Russian Trojckosavask), franked at arrival by Chinese postage due stamp 20c. 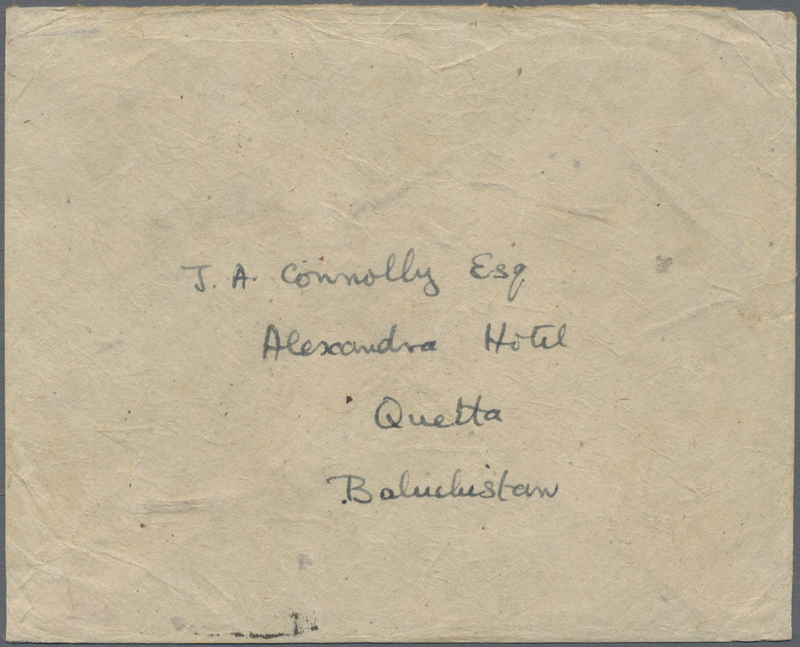 blue and 30c. 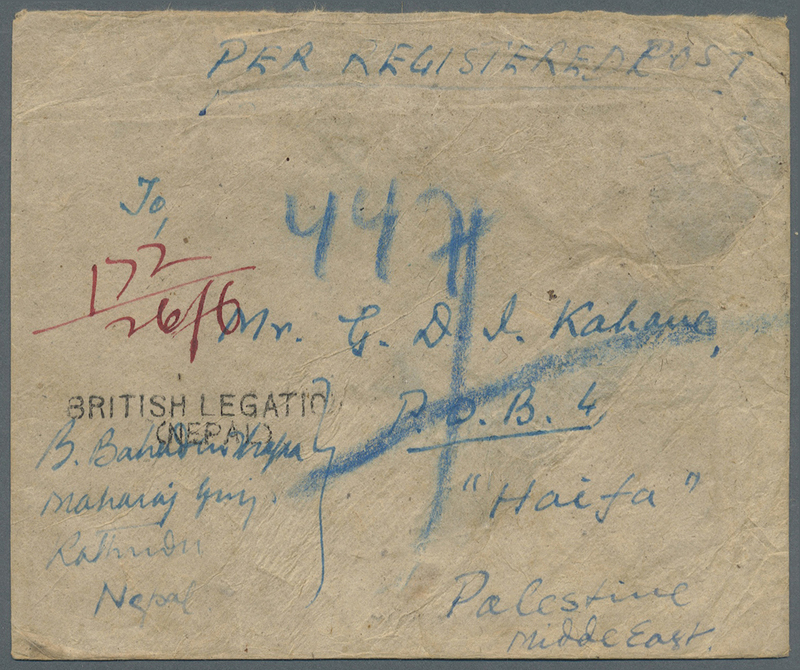 blue tied by bilingual KALGAN cds. 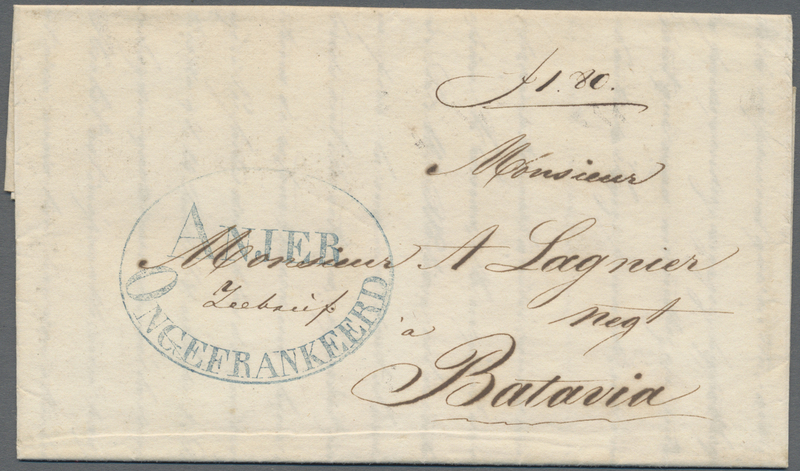 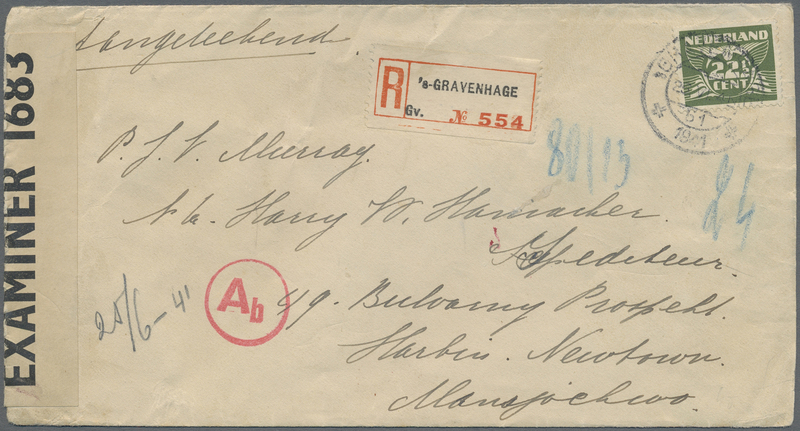 A FINE AND SCARCE COVER FRANKED BY 'Menge' PROVISIONALS. 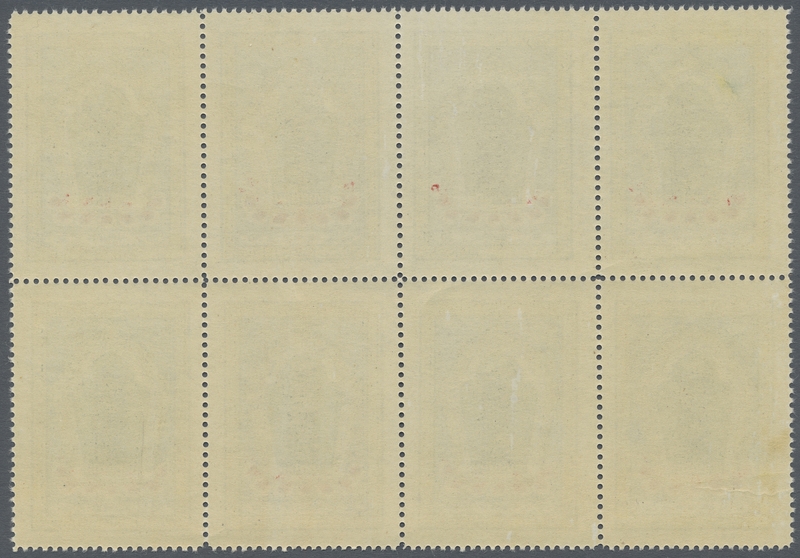 9392 ungebraucht (hinged) * SG 163 - 167 1959 (1 Sep). 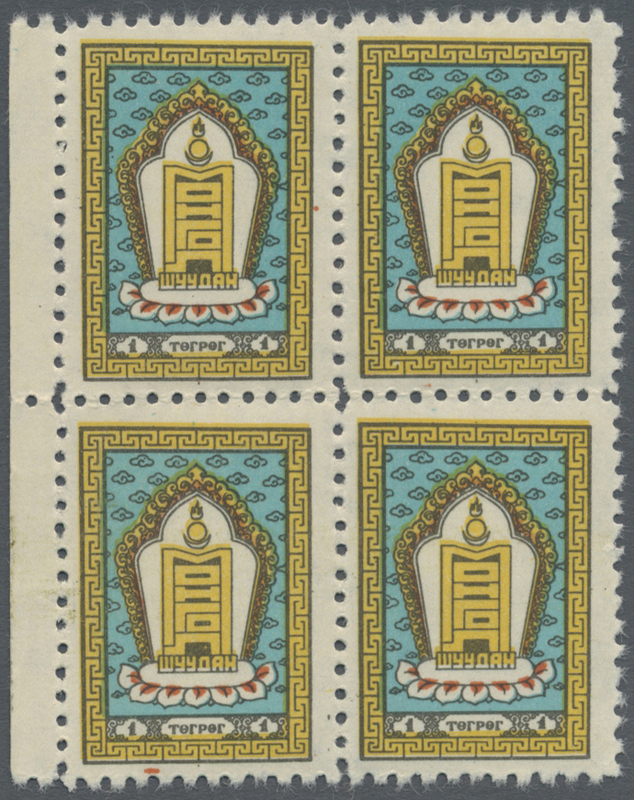 Mongolists’ Congress. 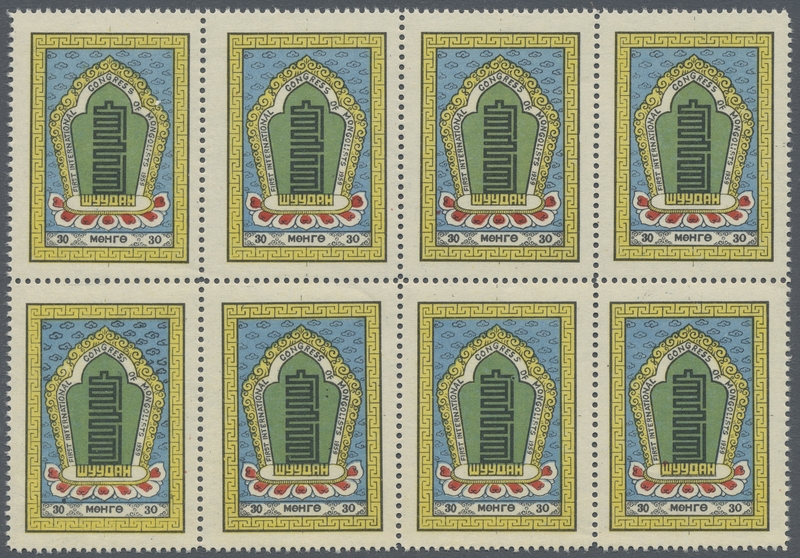 30m green, blue, yellow and red, 40m red, blue and yellow, 50m green, blue, yellow and red, 60m red, blue and yellow and 1T yellow, turquoise-blue and orange, Perf 11 for “large” designs, Perf 9 for top value. 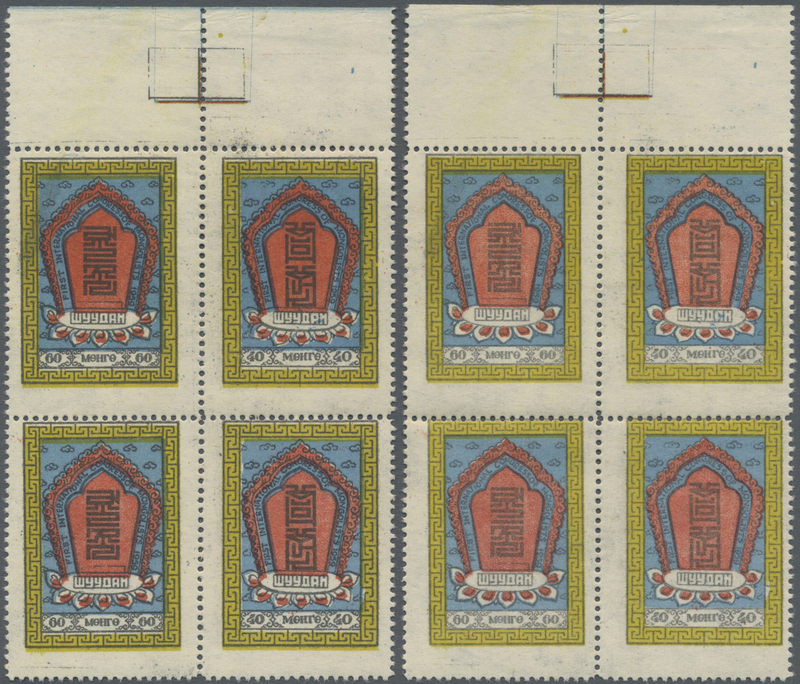 Mint set of five with 30m & 50m and 60m & 40m in se-tenant pairs (from the middle of large printing sheets). 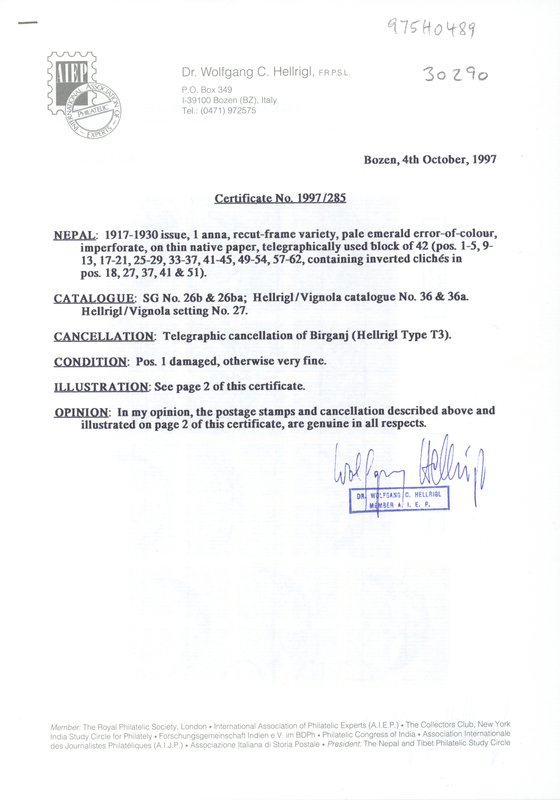 SG cat. 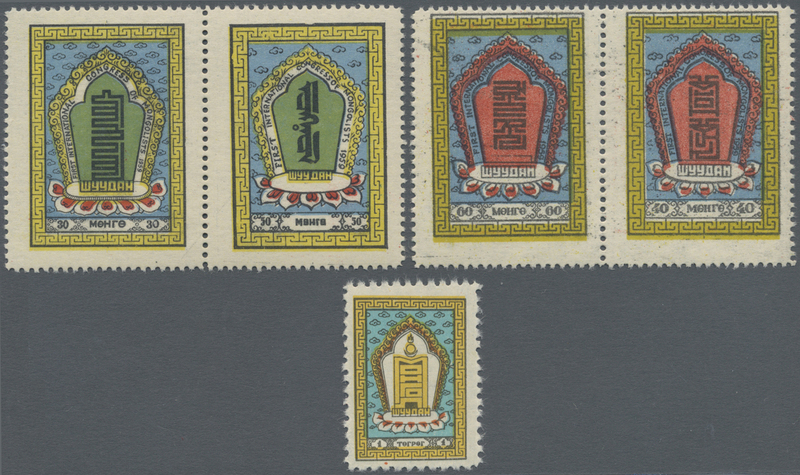 £38 for “normal” set. 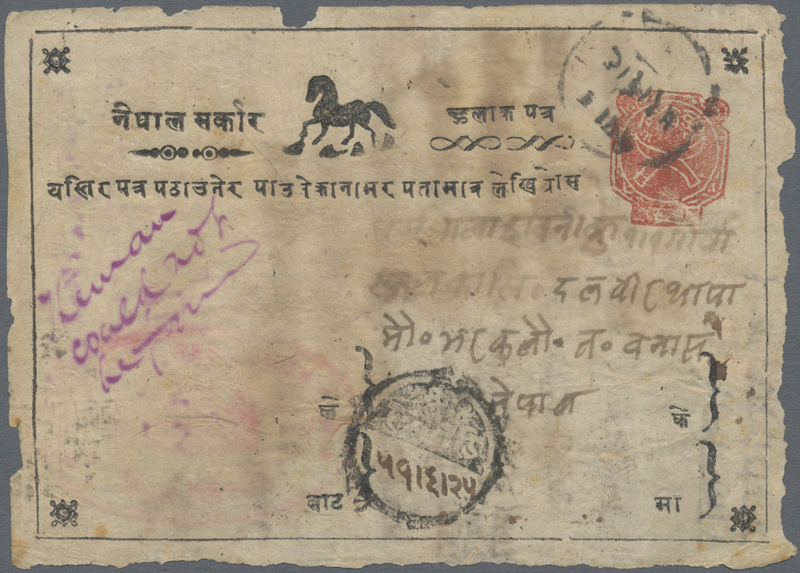 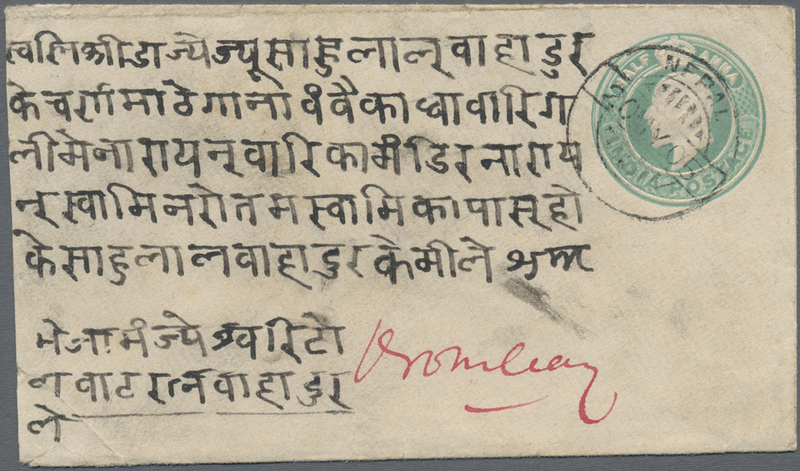 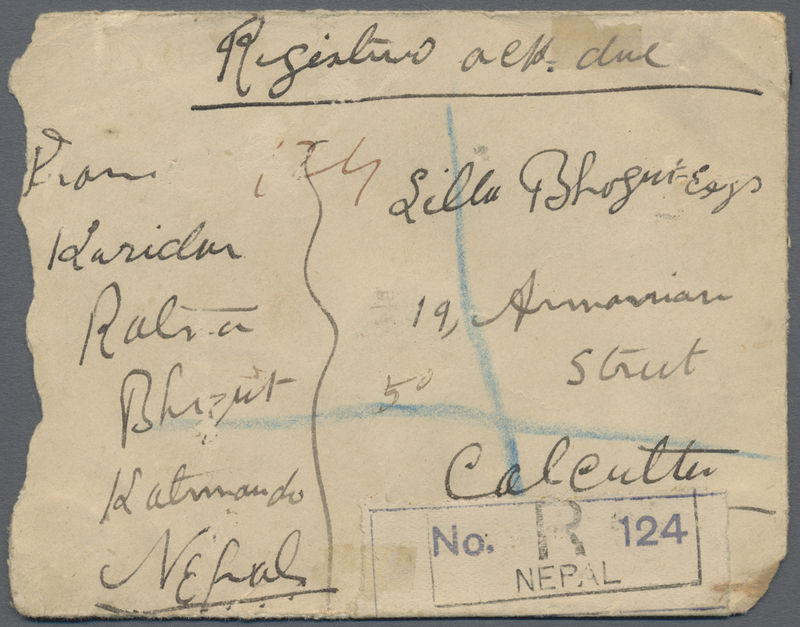 9397 Brief (cover) NEPAL 1894-1949, Four covers from Nepal to India all franked by Indian definitives, with 1894 cover to Calcutta franked QV ½a. 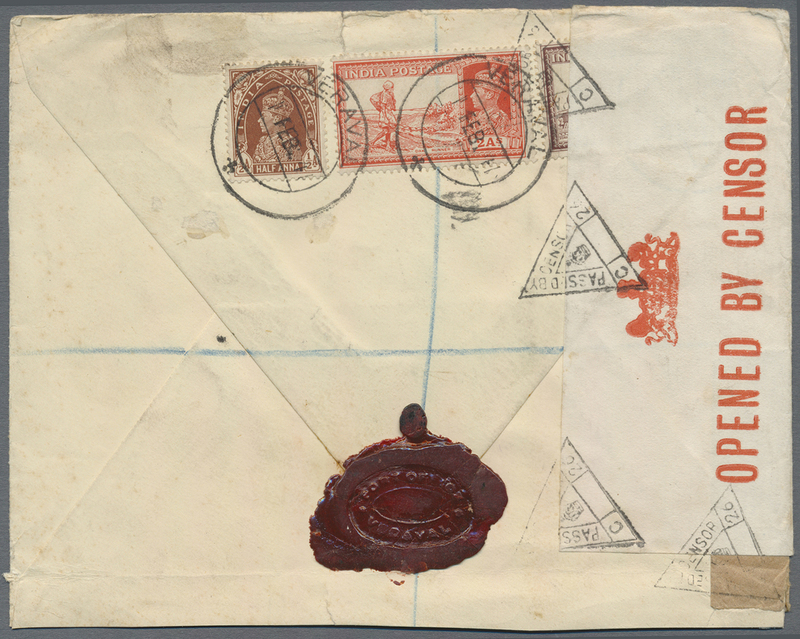 tied by squared "NEPAL/24 SE/94" cds (cover faults), KEVII. 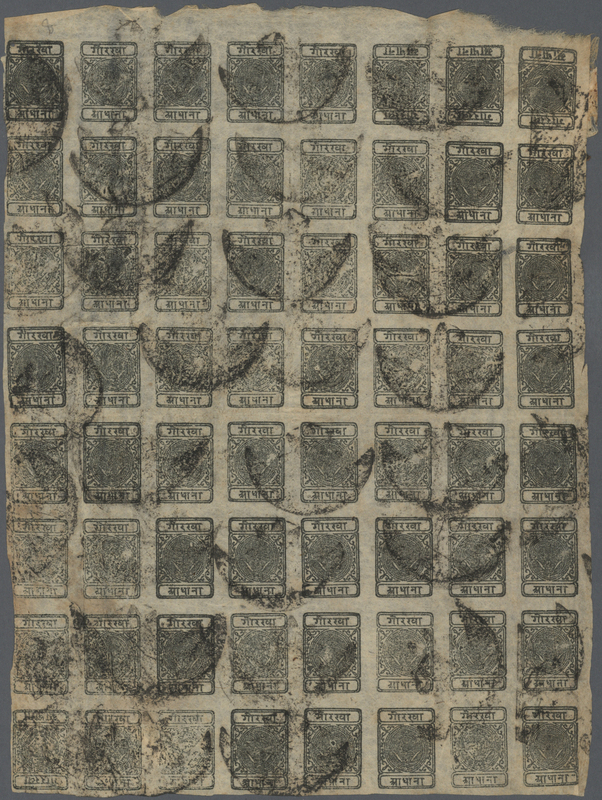 ½a. 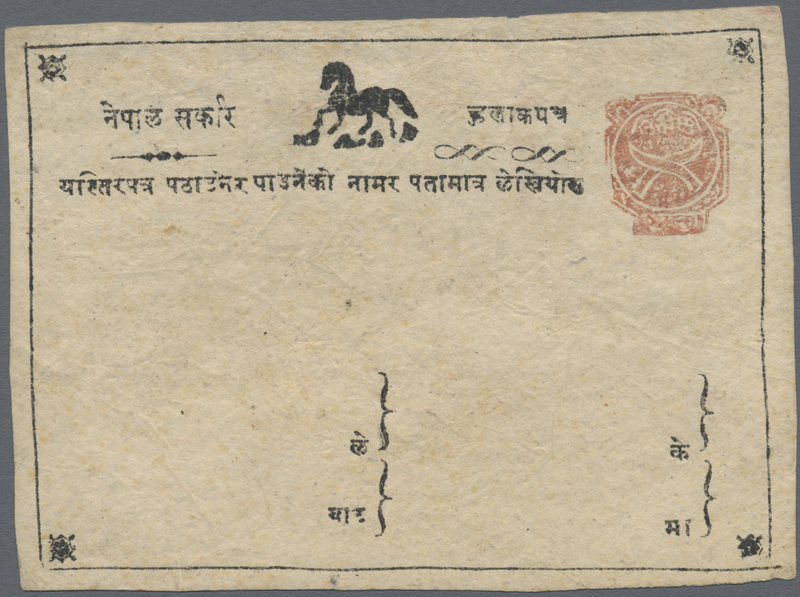 postal stationery envelope used to Bombay 1905, 1945 cover to Quetta and 1949 registered cover to Bombay with "INDIAN EMBASSY (NEPAL)" handstamp on the old 'British Legation Nepal' registration label. 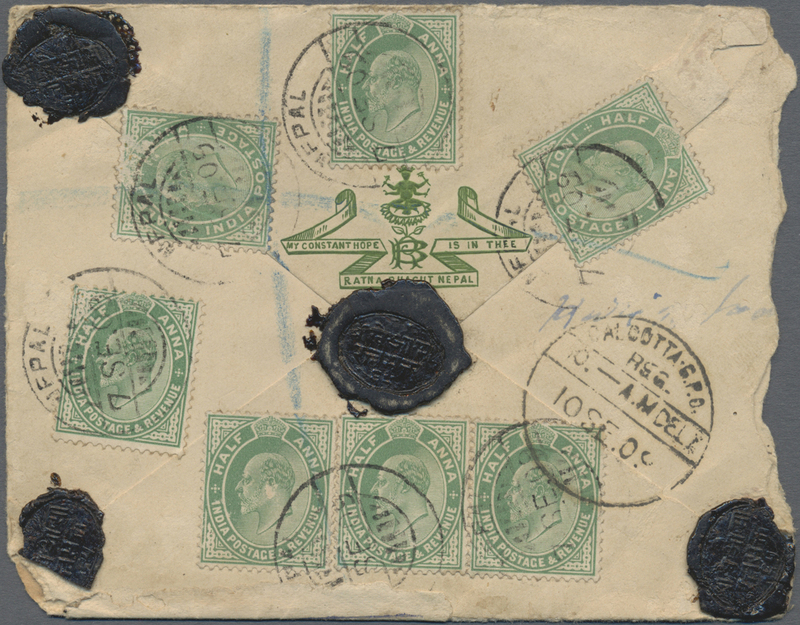 An interesting quartet in mixed condition. 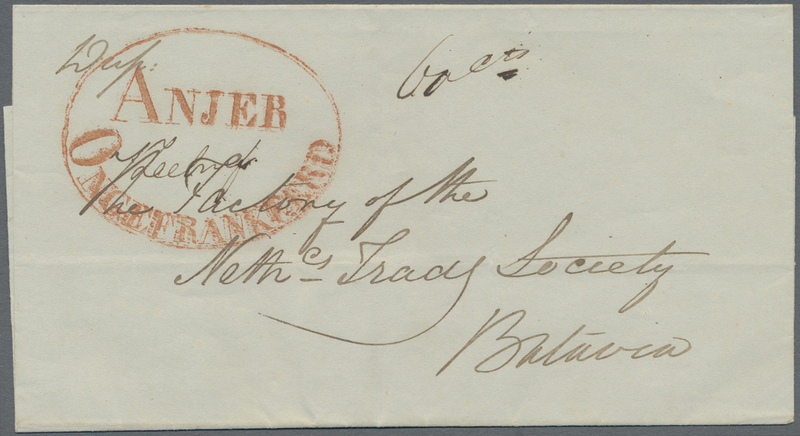 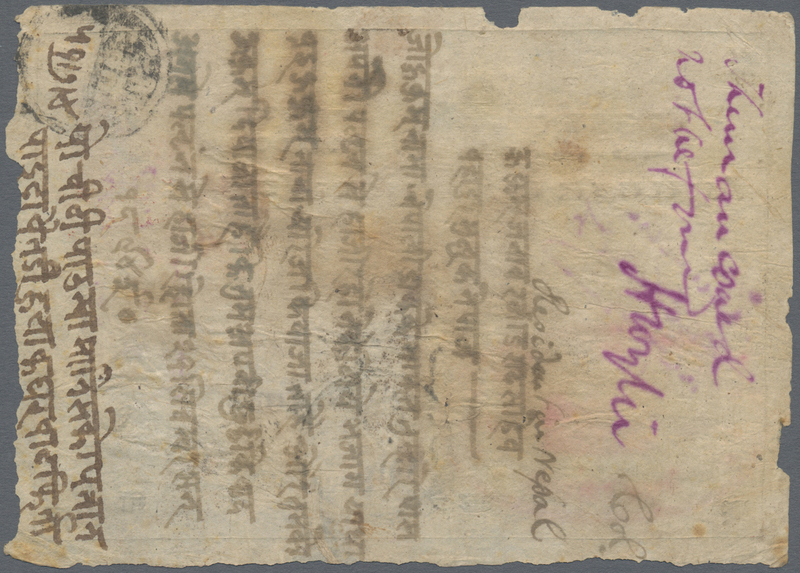 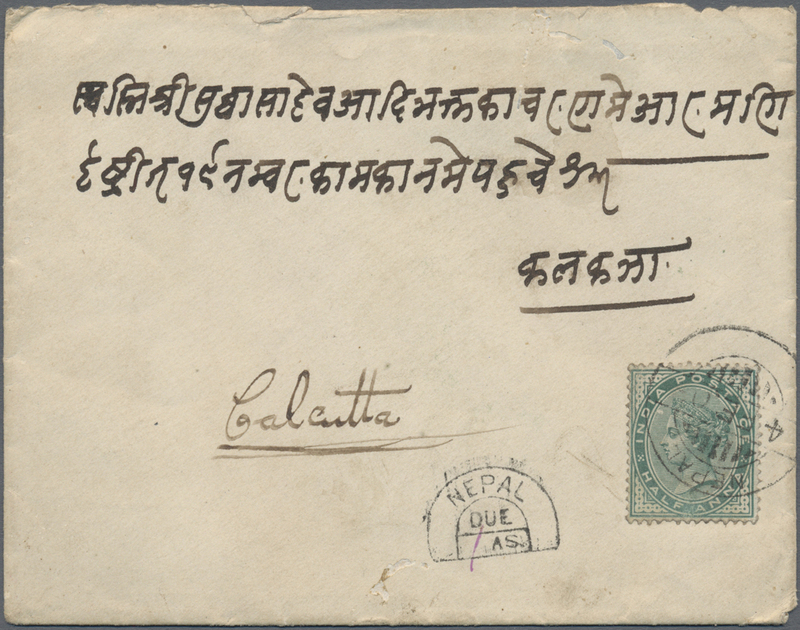 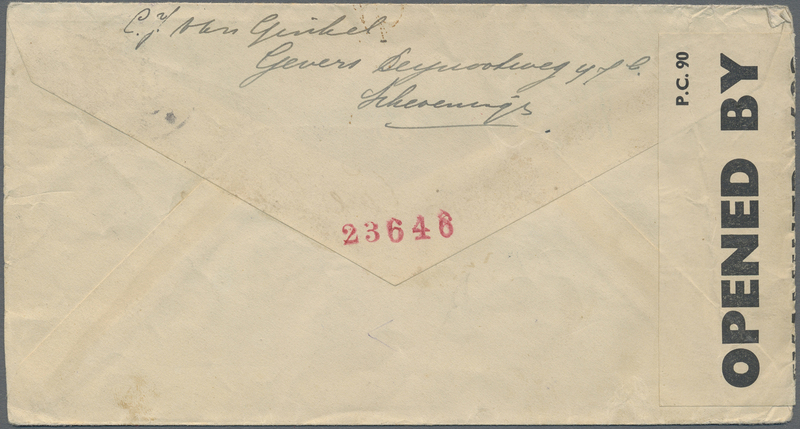 9403 Brief (cover) NEPAL 1903/1909: Two covers from Kathmandu to Calcutta both franked by Indian adhesives, with 1903 cover insufficiently franked QV ½a. 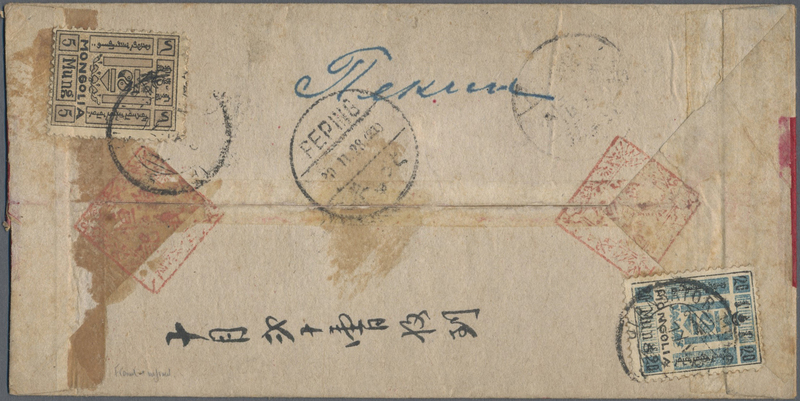 only, tied by "NEPAL/4 FE 03" cds, with "NEPAL/DUE/(1) AS." 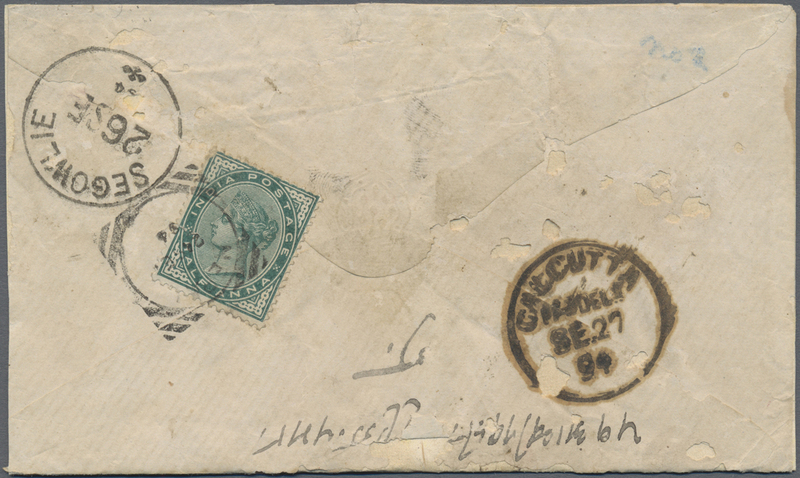 semicircle postage due h/s alongside, and on the reverse with Calcutta arrival cds and small oval "CALCUTTA G.P.O./7 FE 03/UNPAID" h/s in green, and 1909 REGISTERED cover franked by seven Indian KEVII. 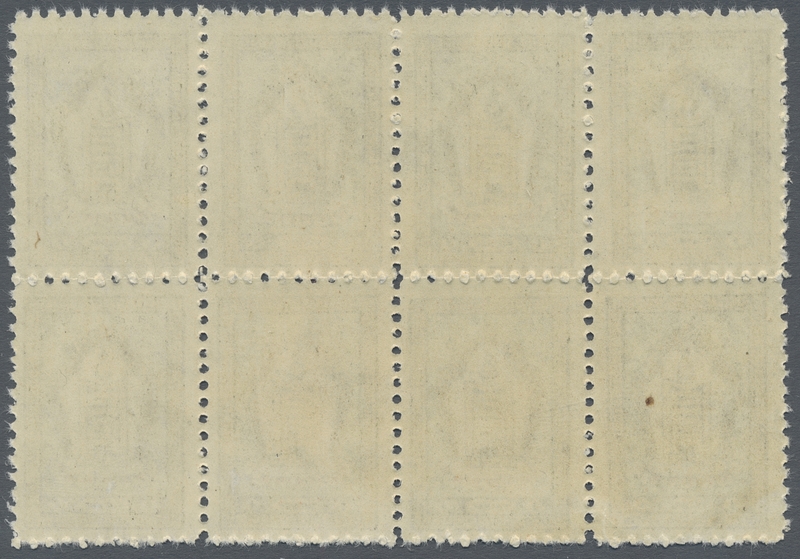 ½a. 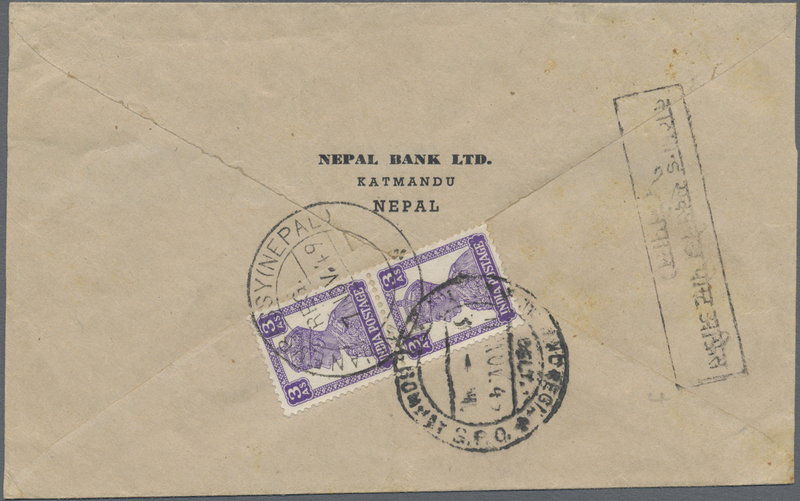 tied by "NEPAL/7 SE 09" cds, with reg. 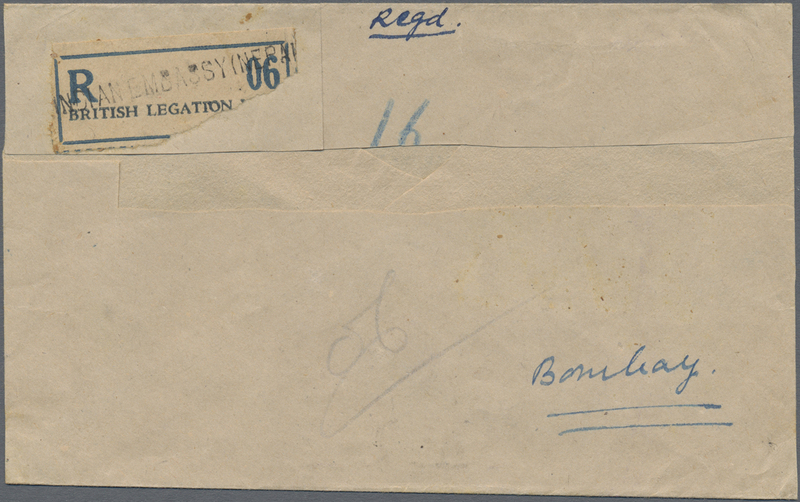 label on front and Calcutta arrival cds on back, both covers with opening faults otherwise fine. 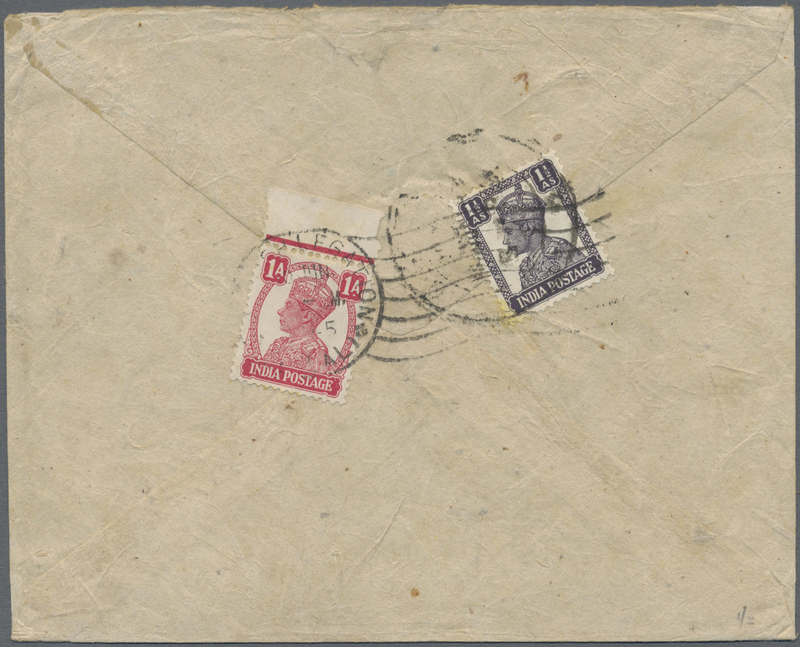 An interesting and scarce pair of covers. 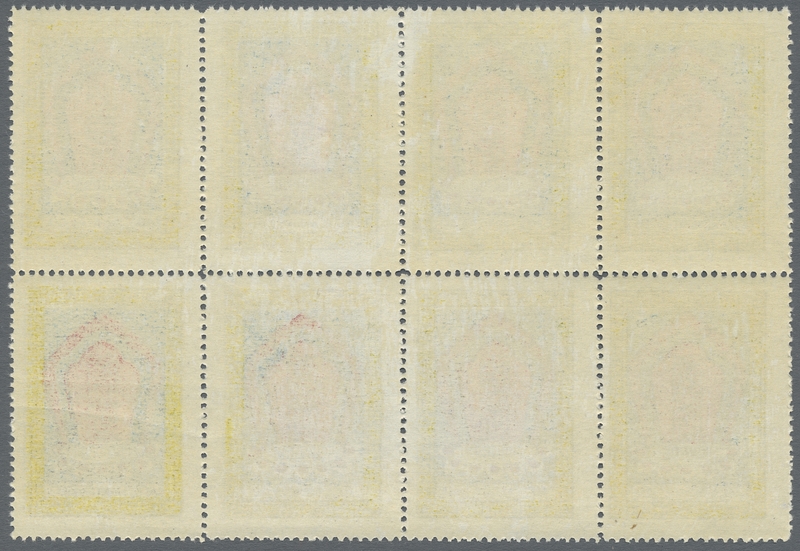 9406 ungebraucht ohne Gummi (unused without gum) (*) 25 (SG 42) (64) 1917-28 1a. 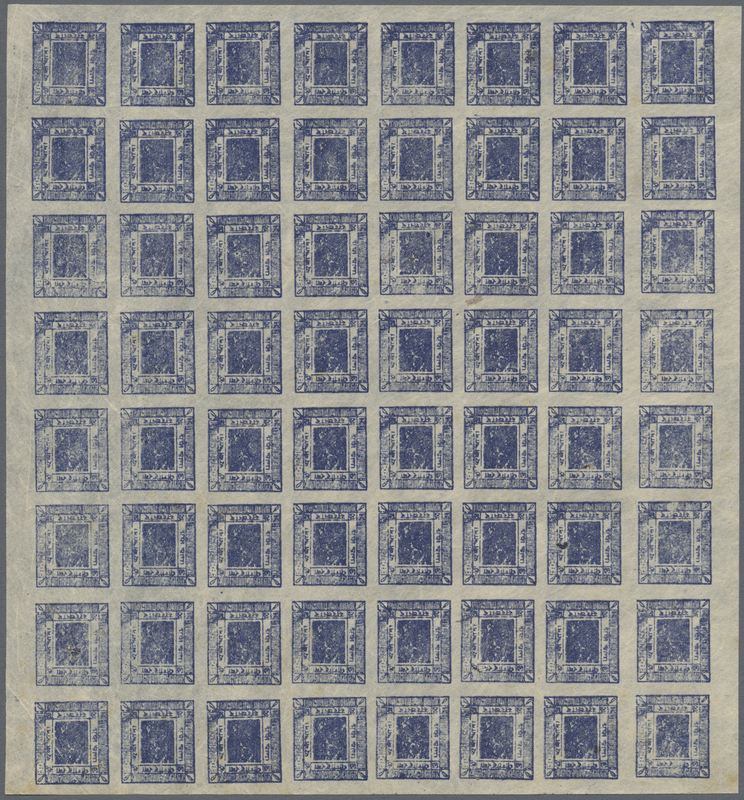 deep blue, redrawn Type 1, imperforated, complete sheet of 64, unused without gum as issued, fine. 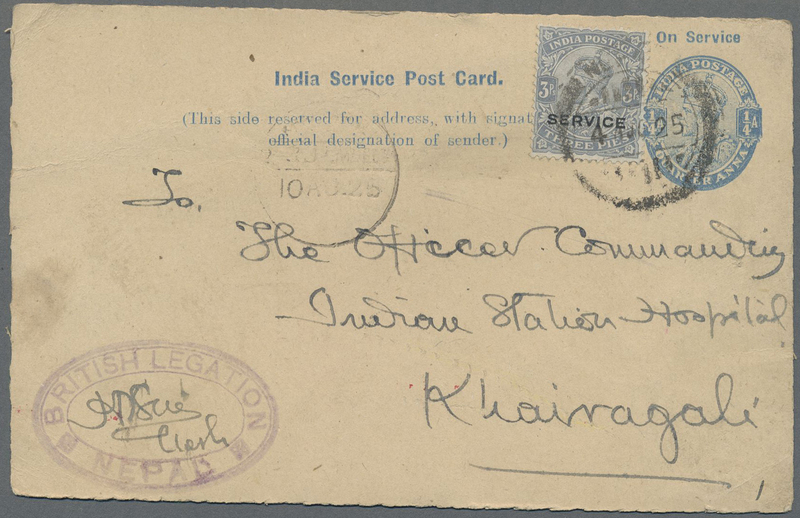 9407 Ganzsache (Complete) H&G D-10 of India 1925: Official India postal stationery card KGV. 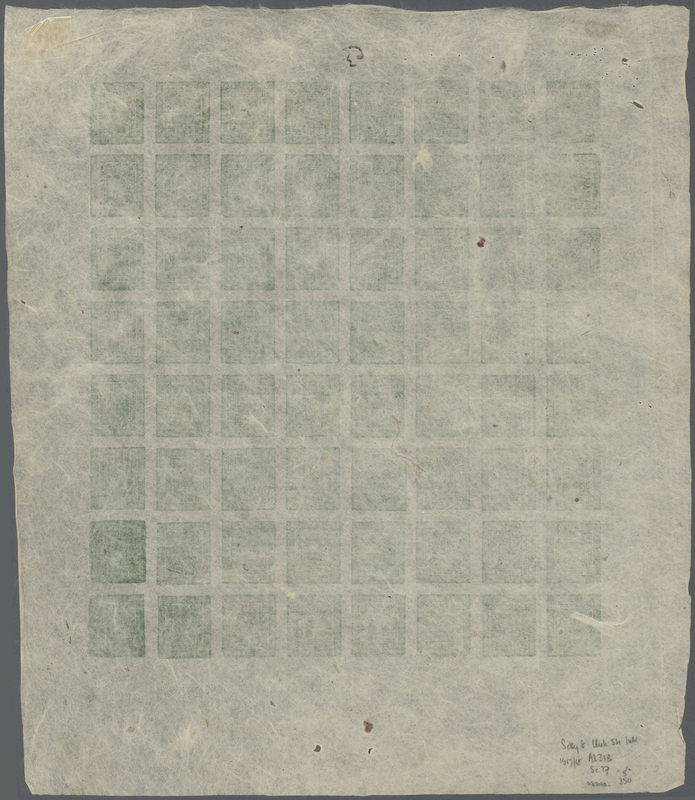 ¼a. 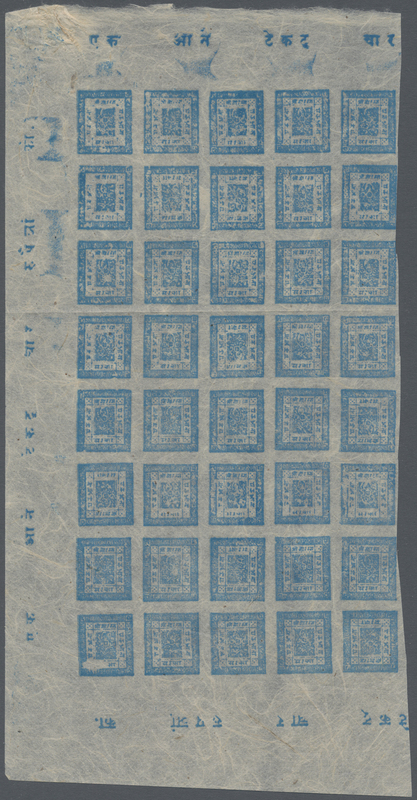 ultramarine on buff (1921), uprated by India KGV. 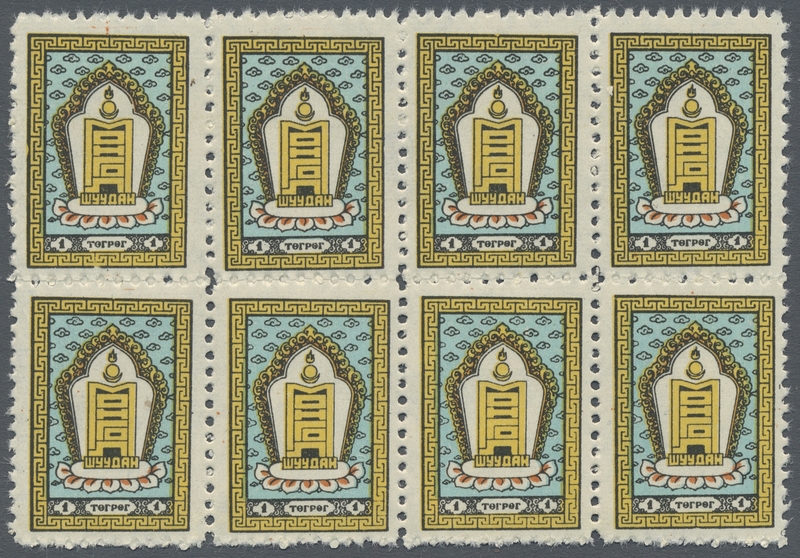 3p. 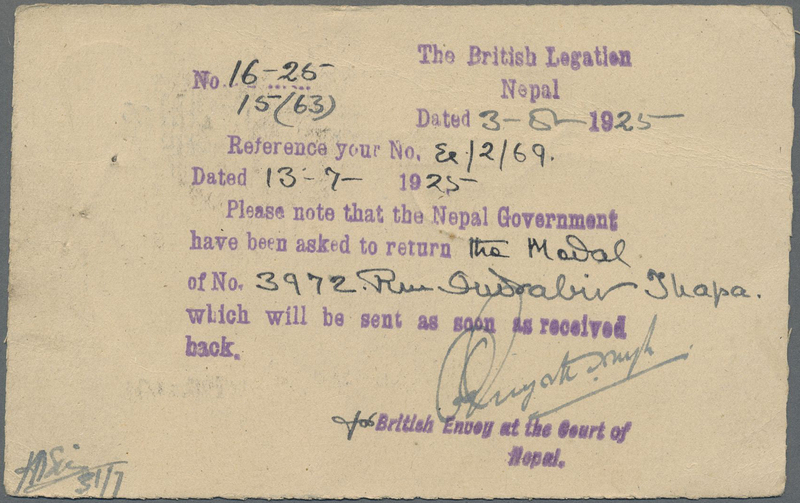 grey surcharged "SERVICE", and used by the British Legation, Nepal to 'The Officier Commanding Indian Station Hospital in Khairagali', cancelled by "NEPAL/4 AUG 25" c.d.s., with "BRITISH LEGATION NEPAL" oval handstamp, signed within, and Khairagali '10 Aug 25' arrival cds alongside. 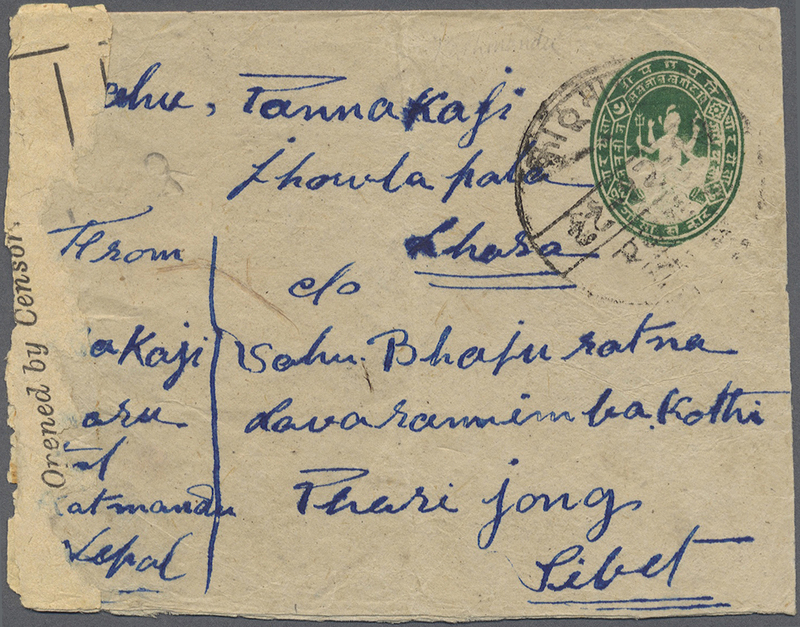 A VERY SCARCE INDIAN OFFICIAL POSTCARD USED FROM NEPAL.